Premises came alive with the musicale, an exciting and interesting blend of musical programme on 14th July, 2018. The evening brought together the bubbling alumni right from 1989 batch to the recent pass outs. The occasion was graced by more than 250 alumni coming from all corners. 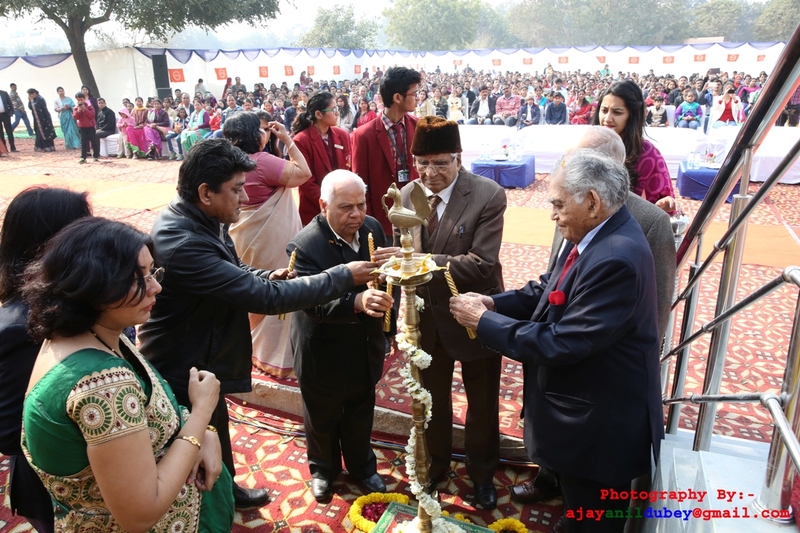 The entertaining sundown traditionally started with the lighting of the lamp by the Hon’ble guests- Sri H L Bhatia, along with the school principal Mrs. Anju Puri and eminent alumni. Speaking on the occasion, the principal underlined the achievement of the school and contributions of alumni towards the growth of the Alma Mater. She also shared her pride about the achievements of our alumni in all fields whether it is cinema, sports, music, theatre or politics. 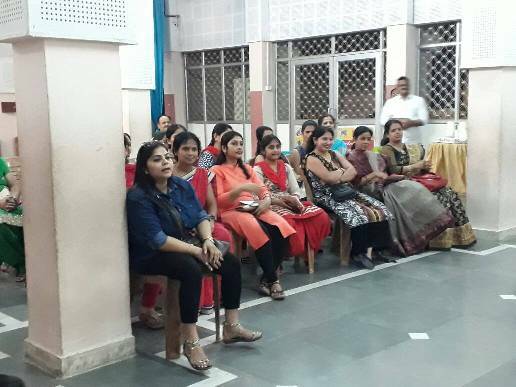 Inter-actors and students of DAV Public School, Vasant Kunj organised a programme expressing their gratitude to the support staff for all their hard work and efforts which they put in to make our lives clean and comfortable at school. The event was graced by Principal Ma'am and the students who performed a dance and shared their feelings through their poems and speeches. 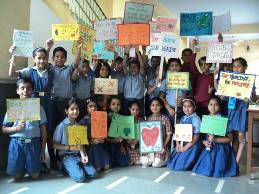 Earth Day was celebrated in school enthusiastically to sensitise the students about the need to protect our Mother Earth. Several activities ie poster making ,skit , paper bag making , tree plantation , screening of film on chipko movement were organised. Students of Class V presented a Skit on the life and times of Mahatma Hansraj. 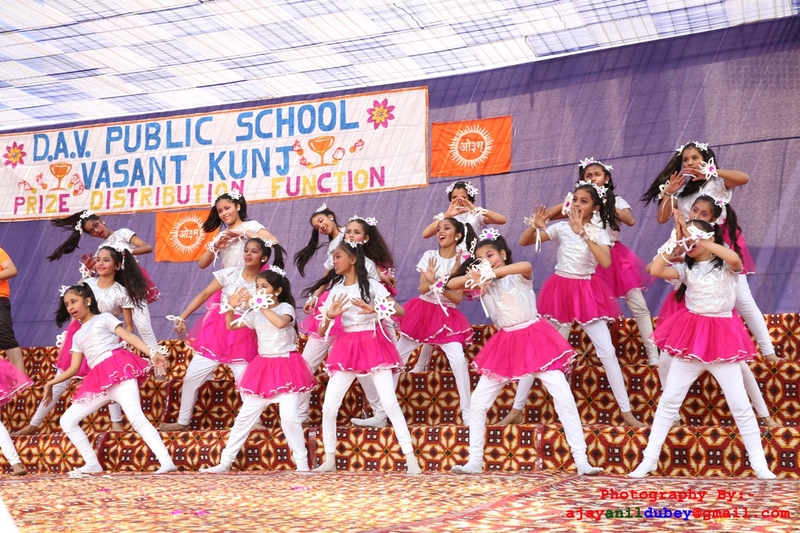 Students of Class VI-VIII participated in a fusion dance ( Folk Dance of Punjab and Western Style Dance). Students of class VI performed a Skit depicting the importance of Health day in the assembly. 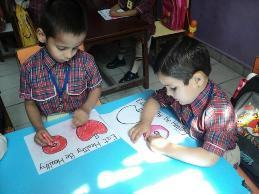 Primary Classes were also involved in various activities. 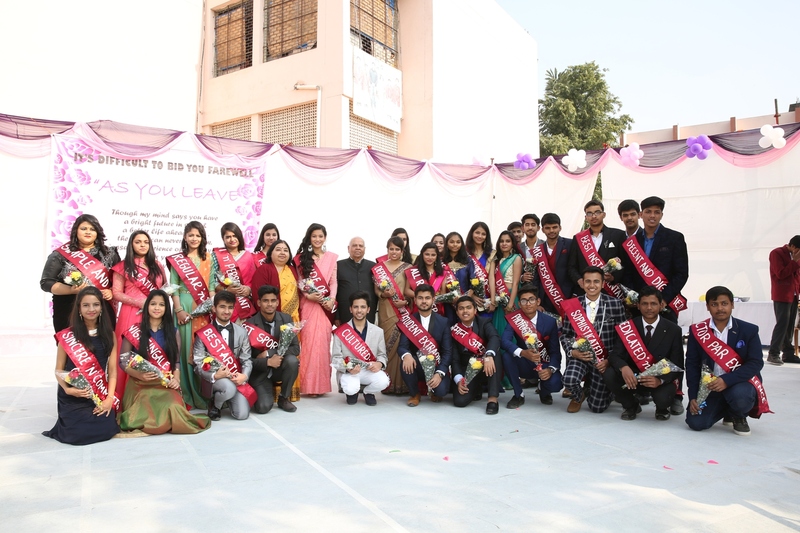 Students of Class XI gathered today to bid farewell to the outgoing class XII batch, on 24 th of Dec.2017. The day was a fiesta devoted to the years spent together with friends and teachers to reminisce joyous moments. It was an occasion for the outgoing students to reminisce time that they spent in the Campus and the education that they acquired during the period. The program started with chanting of Gyatri Mantra. The melodious DAV Gaan filled the atmosphere with harmony. A variety of dance, music, games and laughter were there to entertain the final year batch. After all the fun and frolic, the head girl and the head boy, thanked their alma mater for all their guidance and affection. They also shared their memorable moments spent with their classmates, juniors and faculty. The students who stood out and had shown exceptional qualities were adorned with special titles. School principal, Mrs. Anju Puri, wished all the best to the outgoing students for success and accomplishments in all their future endeavors. The programme ended on a note-‘Understand your worth. Value your life- Appreciate your blessings’. 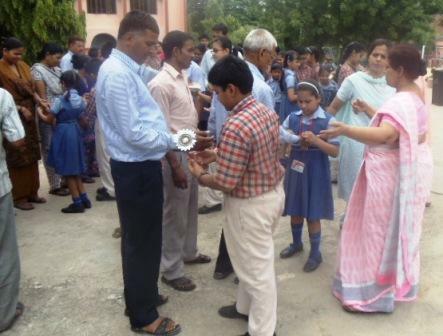 Vigilance Awareness Week was organised in school. 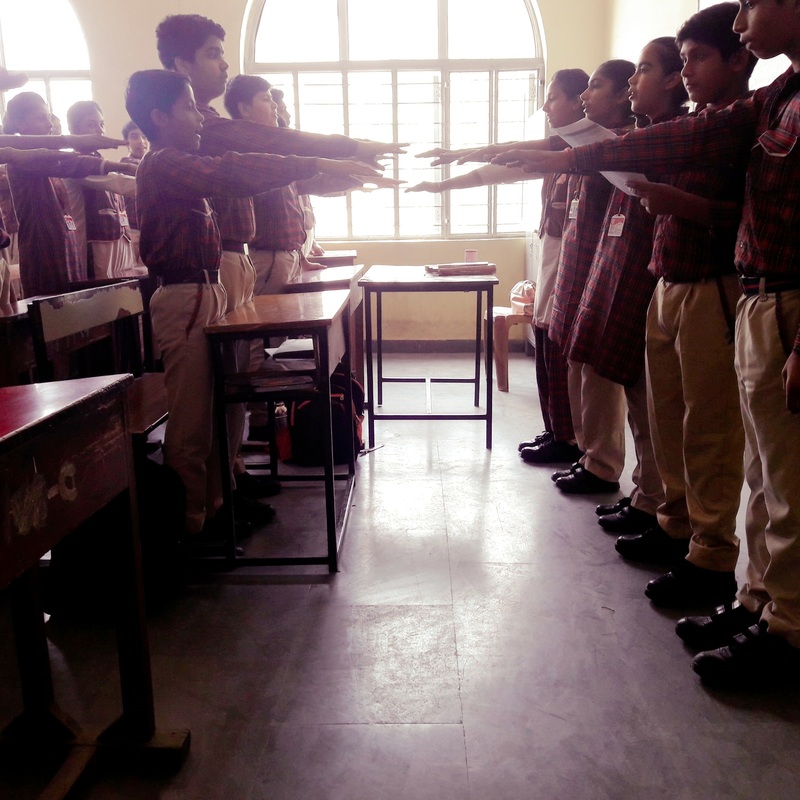 Besides taking integrity pledge a variety of students participated in variety of activities from 30th October,17 to 2nd November ,17.Class XII wrote articles on the topic “My Vision of Corruption Free India”. Class XI prepared PowerPoint presentations on the role of different sections of society in combating pollution. Other classes participated in debate, slogan writing and poster making competitions on topics related to corruption. The sparkling presence of Manager Sir and Madam Principal Anju Puri added glow to the warmth & happiness of the Diwali celebrations. The sparkle of joy could be seen all around. The installation ceremony for Interact Club of DAV Public School. It was an occasion graced by the members of the Rotary Vasant Valley Club. The office bearers felt proud and honored and promised to carry out their duties diligently in the community service programmes scheduled for the session. Freedom in mind, Faith in words, Pride in our heart, Memories in our soul. We have celebrated our 71st Independence day in the presence of our esteemed guests at DAV PUBLIC SCHOOL VASANT KUNJ. The day that celebrates the essence of a mother is Mother's Day. One of those occasions that none of us can afford to miss. Keeping this bonding emotion in mind, we had a special Celebration on mother’s day. Mothers were invited and students presented a lovely show dedicated to their mothers encompassing skits, dances & songs to showcase their love for their mothers. The heart warming gestures of their children gave immense joy to mothers of our students. 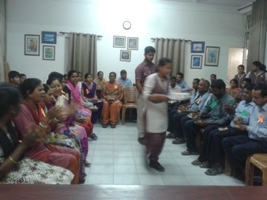 The Interactors at DAV celebrated Labour Day amidst the support staff with great enthusiasm and warmth. It was an opportunity for the students to thank these valuable contributors of the school who are always there for extending a helping hand to the children and without whom life at school would never be as enjoyable and comfortable….cleanliness in the corridors, classrooms, lovely flowers in the garden, help and security all around and sparkling washrooms ! The programme was marked with heart touching moments when students shared their feelings with everyone about them – how they always serve with a smile - at all times of the day. This was followed by lively singing, clapping and laughter. The tiny tots and students from middle wing showed gratitude by putting badges of thanksgiving on their collars. It was a proud moment for the staff members as they felt ‘valued and loved’ by the students. This was followed by a round of refreshment. 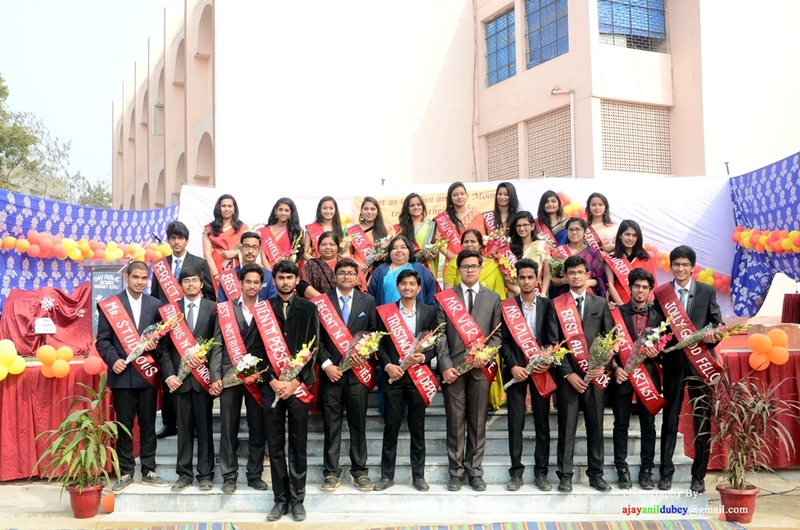 On 28th Jan.2016, Students of class XI ,bid farewell to the outgoing class XII batch. It was a commemoration devoted to the years spent together with friends and teachers to reminisce blissful moments. The day started with buoyant excitement and merriment, as all the Class Twelve students dressed up to their charismatic best and arrived for the captivating ceremony: the boys looked dashing in their tuxedos and the girls, who never fail to put on a show, were draped in ravishing saris bought for the event.It was an occasion for the outgoing students to reminisce time that they spent in the Campus and the education that they acquired during the period. The program started with chanting of Gyatri Mantra. The melodious DAV Gaan filled the atmosphere with harmony. A variety of dance, music, games and laughter were there to entertain the final year batch. After all the fun and frolic, the head girl and the head boy, thanked their alma mater for all their guidance and affection. They also shared their memorable moments spent with their classmates, juniors and faculty. The students who stood out and had shown exceptional qualities were adorned with special titles. School principal, Mrs. Anju Puri, wished all the best to the outgoing students for success and accomplishments in all their future endeavors. The programme ended on a note-‘Learn to be yourself always no matter the circumstance, be principled, and be worthy of the trust’. Keeping the festive spirit alive Dussehra was celebrated on 7th October, 2016 to mark Lord Rama’s victory over Ravana and to reinforce the message that good always triumphs over evil, the effigy of Ravana was burnt. 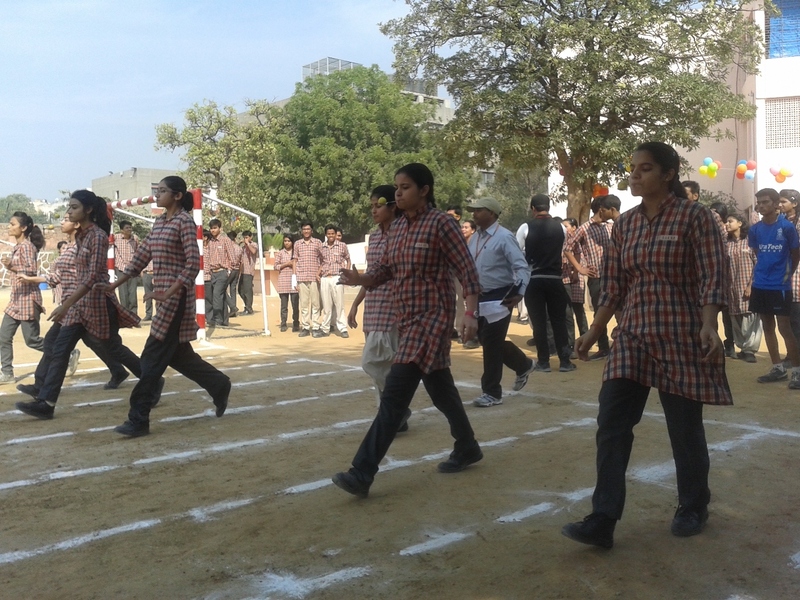 The Investiture ceremony was celebrated in the school. The newly appointed members of prefectorial board took the oath to abide by the school rules and hold the school motto in high esteem. World Dance Day was celebrated on 29th April, 2016 , under the ISA 2016 project- Celebrating Life Through Dance.The non-stop 4 hours Dancethon of solo, duets and group performances was conducted.The event featured over 110 dancers on the eclectic and democratic platform where the budding talents showcased their flair.The entire performance was vibrant, immensely beautiful inundating the audience with rhythm and pulsating cosmic vibe of dance. Students showcased their love for mother and participated enthusiastically. VED PRACHAR’ was organised on 30th April, 2016 at the school premises.The students were apprised about the benefits of hawan. Students took active participation in physical activities and music classes. Earth day is an annual observance held on April 22 every year to increase public awareness about the environment. 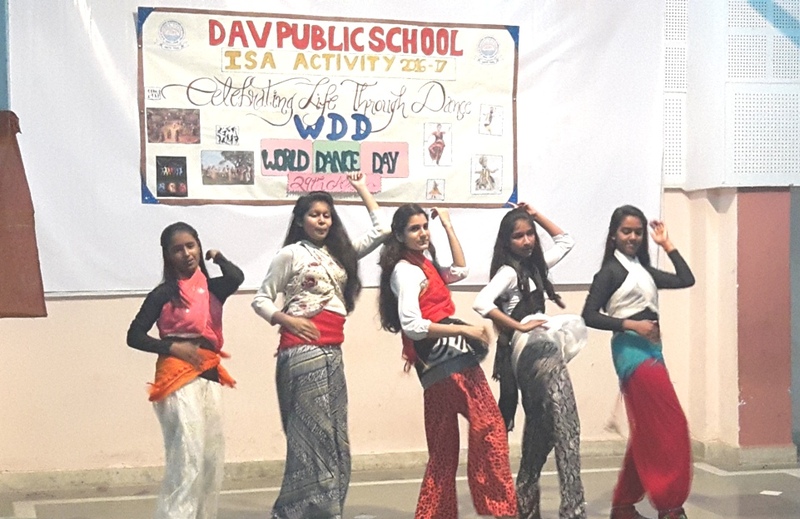 A Dance Performance was given by the students of class V and a Poster-making Competition was organized in the school for class VIII. 151 Birth Anniversary of Mahatma Hansraj was celebrated. 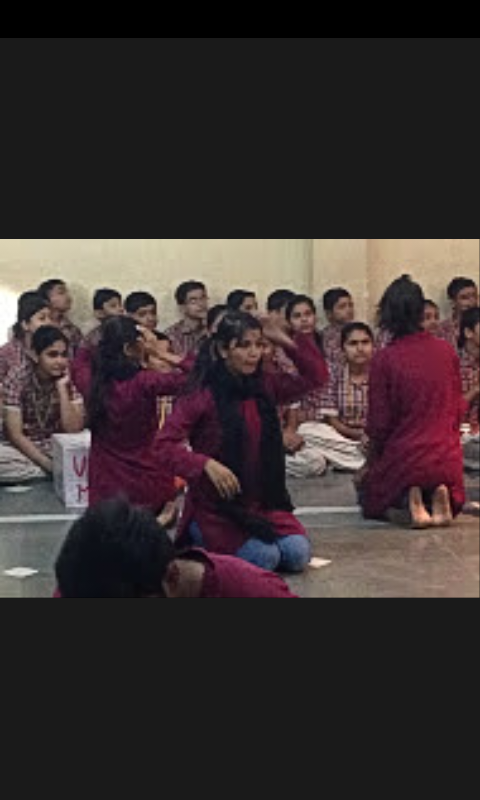 The students of class VIII performed a skit on the life of Mahatma Hansraj. Baisakhi festival was celebrated on 13th April 2016 with great enthusiasm. This vibrant festival marks the time for harvest marks the time for harvest of rabi crops. 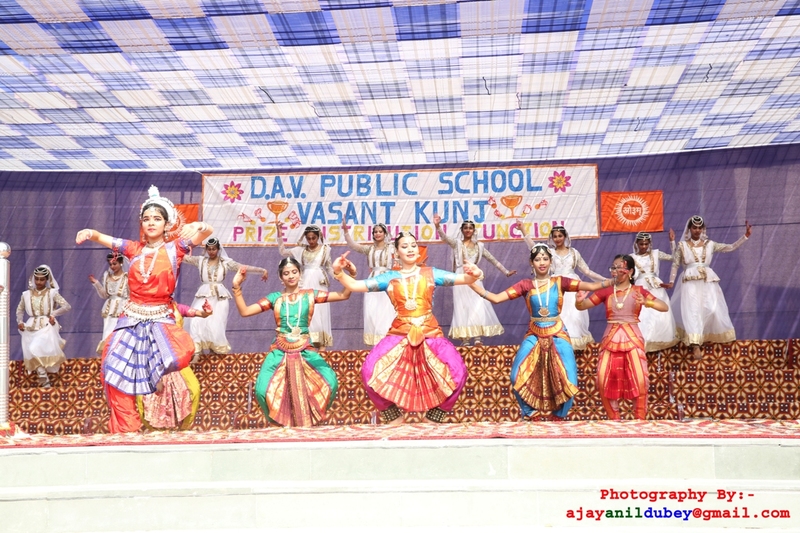 On this occasion a skit was performed and a dance performance was given by the students of class V and VI .The purpose was to make the students aware about the historical background, significance and relevance of Baisakhi. Baisakhi Festival marks the time for harvest of rabi crops and they celebrate the day by performing joyful bhangra and gidda dance. World Health Day was celebrated on 7th April to highlight the significance of good health and well-being. Various activities such as Poster Making Competition, Healthy Food Preparation and Skit presentation on “Do Yoga Stay Fit” were conducted. Prize Distribution Function was organized on 6th February ,2016 to award the meritorious students in academics ,sports and co-curricular activities. The august gathering that graced the function comprised of Vice- chairperson of DAV College Managing Committee,Shri T.R. 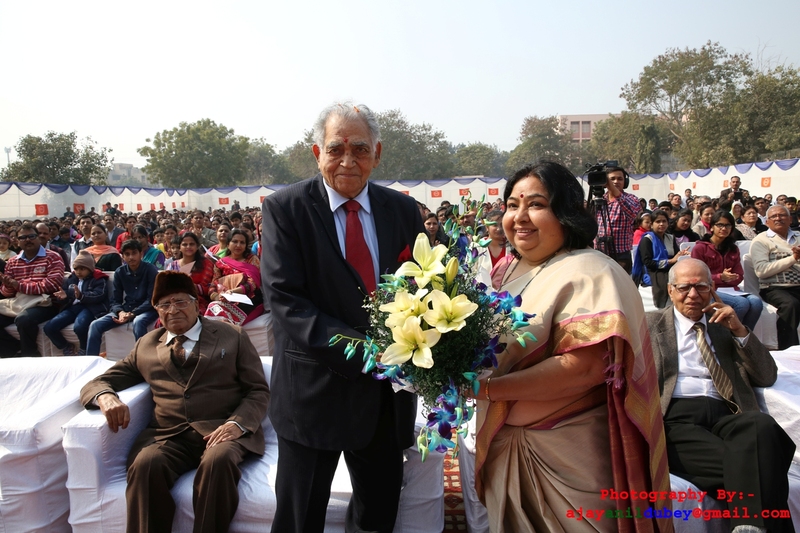 Gupta who was the Chief Guest,Ex Principal Hansraj College,Shri J.K. Kapoor ,Manager of school Shri H.L. Bhatia ,the principals of different schools and parents. 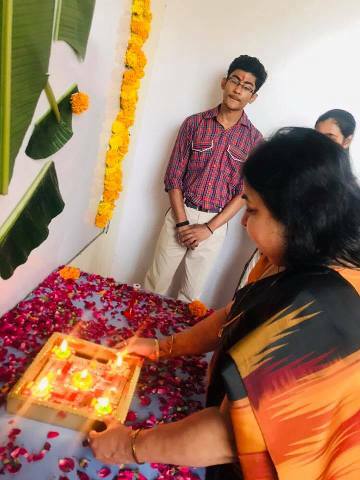 The programme began with lighting of the lamps and chanting of ‘mantras’ followed by a mesmerizing musical symphony .The Principal Mrs. Anju Puri presented the report of school achievements and apprised the audience about school’s future endeavors. 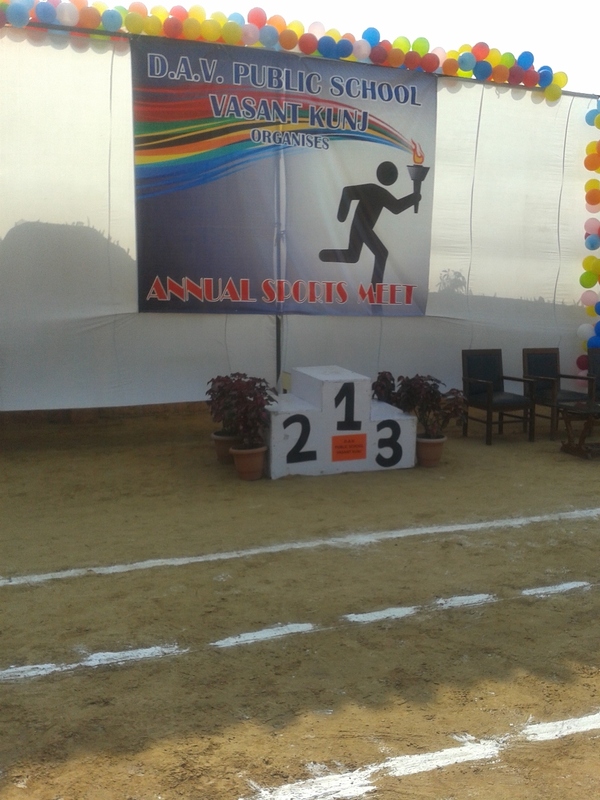 Thereafter the students received awards amidst lot of cheering and clapping. The chief Guest addressed the audience and talked about the contribution of DAV organization in imparting quality education ,role of schools in development of a child’s personality etc. The programme had a grand finale with a ballet , ‘Ved Se Vidyalaya Tak ‘ which highlighted the transformation of education from vedic times and was highly appreciated .The function ended with ‘Vote of Thanks ‘ and ‘Shanti –Paath ‘. 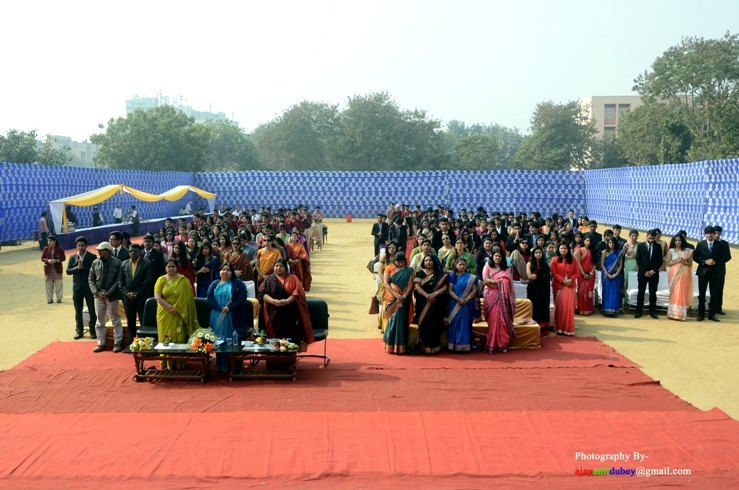 Students of senior classes gathered today to bid farewell to the outgoing class XII batch. The day was a fiesta devoted to the years spent together with friends and teachers to reminisce joyous moments. The day started with great excitement and merriment, as all the Class Twelve students dressed up to their glamorous best and arrived for the glamorous ceremony: the boys looked dashing in their tuxedos and the girls, who never fail to put on a show, were draped in gorgeous saris bought for the occasion. The program started with chanting of Gyatri Mantra. Thereafter, there was a variety of dance, music, games and laughter to entertain the final year batch. After all the fun and frolic, the head girl and the head boy, one by one on the Dias and thanked their faculty for all their guidance and affection. They also shared their memorable moments spent with their classmates, juniors and faculty. On the basis of their personalities, they were given different titles by their juniors as well as teachers. In the end, Mrs. Anju Puri, Principal,wished all the best to the outgoing students for success and accomplishments in all their future endeavors. The 67th Republic Day was celebrated in all its solemnity and grandeur. The students and all the staff saluted the National Flag and took a pledge for upholding its honour and integrity. The whole school enjoyed the song, dance and skit performed by the students. 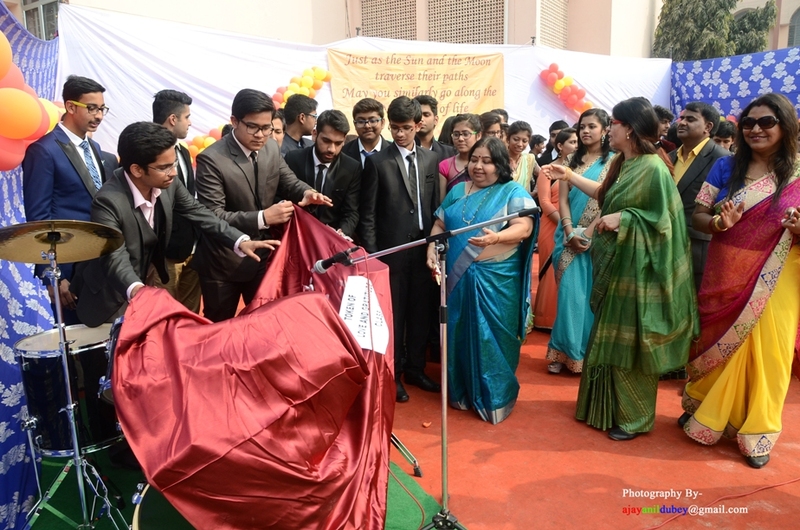 Later, Madam Principal addressed the students and urged them to do their best and feel proud to be Indians. 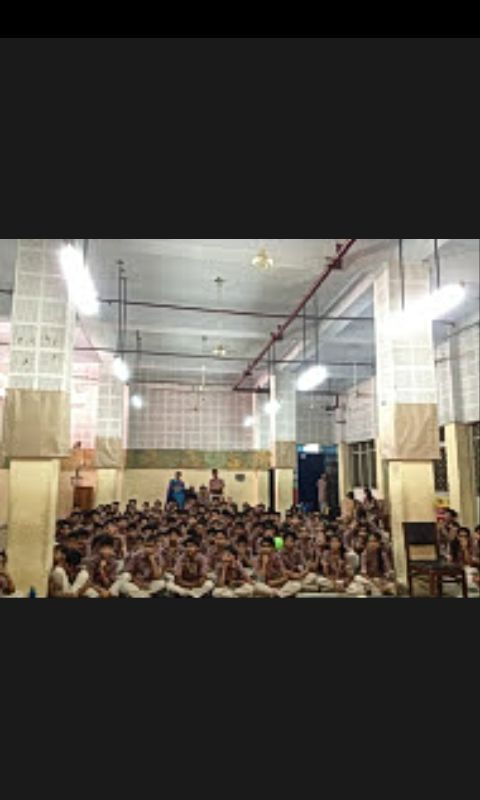 Vedas are the basis of ultimate Truth-dharma/religion, all physical sciences such as aerospace and geology, mathematics/ economics, spiritual sciences all make the basis of vedic civilization or Bhartiya culture.‘VED PRACHAR DIWAS’ was organized on 31st October, 2015 at the school premises. 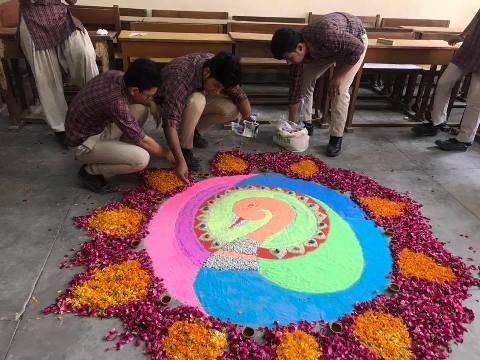 Students from classes V, VI and VII participated. Various events and activities were conducted. The students were apprised about the benefits of hawan. 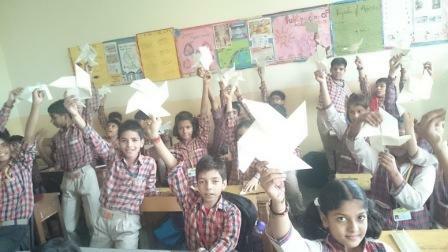 Students took active participation in Quiz and Art & Craft competitions. 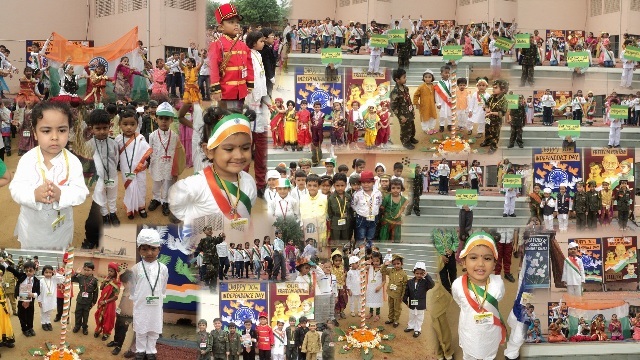 To mark the spirit and prominence of freedom and sovereignty, 69th Independence Day was celebrated with great enthusiasm and effervescence in our school. 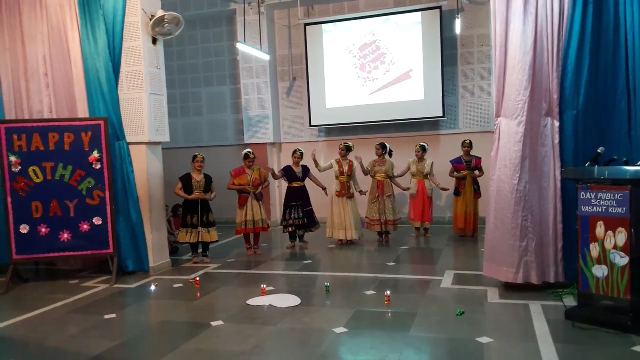 There were many dance performances and skit in which participants participated very enthusiastically.The students also showcased the diverse culture of India by their dance performance named as ‘Morcha’ from the states of Goa, Punjab, Kerala, Gujarat etc. and mesmerized the audience. A skit giving tribute to our former president Dr. A.P.J Abdul Kalam was performed by the students of class V and VII with great enthusiasm.All cultural events interlaced with patriotic fervor and feel. International Yoga Day was celebrated at D.A.V. 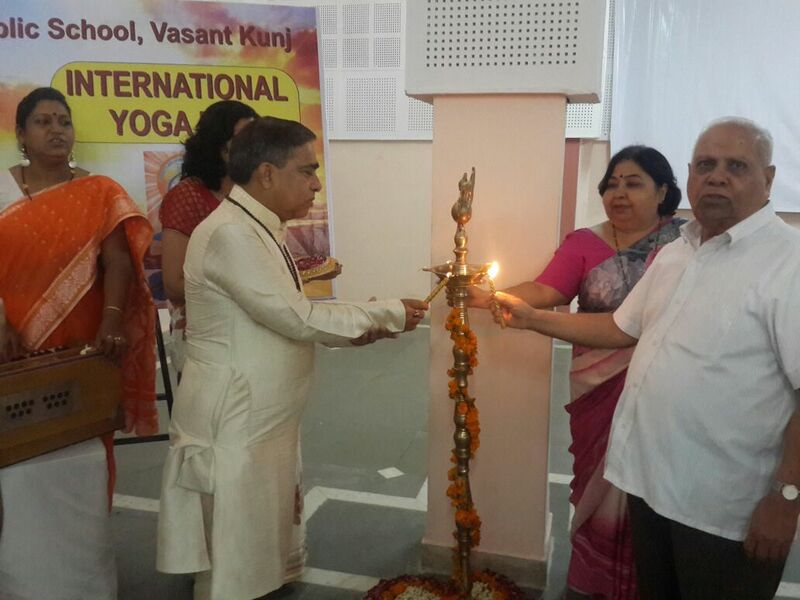 Vasant Kunj on 14th July, 2015.Yogshiromani Dr. Gopalji, a renowned yog exponent, presided over the event as the chief guest. Sh. H.L.Bhatia, former principal P.G.D.A.V. College and manager of the school, also graced the occasion with his benign presence. The programme commenced by invoking the blessings of God through the lamp lighting ceremony which was followed by an address by madam Principal, Ms. Anju Puri, in which she expounded on the utility and necessity of yoga to stay healthy and energetic. The main highlight of the program was the lovely demonstration of different yoga asanas by the students under the guidance of the yoga teacher. The students held the audience captive through their mesmerizing performance. Honorable chief guest, Sh. Gopalji, congratulated the students and appreciated their efforts. In his interaction with the students, he expounded on the significance of yoga and meditation and unveiled the mantras to a healthy and a contented life. He laid emphasis on the inculcation of healthy habits right from the childhood. Sh. H.L. Bhatia shared his childhood experiences with the children and stressed on the importance of yoga to boost immunity and deal with stress and emotions. The informative programme enlightened the students about the benefits of yoga and meditation. Keeping in tune with the tradition of Arya Samaj, Havan in was at DAV Public School, Vasant Kunj . The students of all 3 wings attended this special Hawan. Religious and serene atmosphere was created. Enchanting of mantras; hymns took everyone present over there in the tranquility. 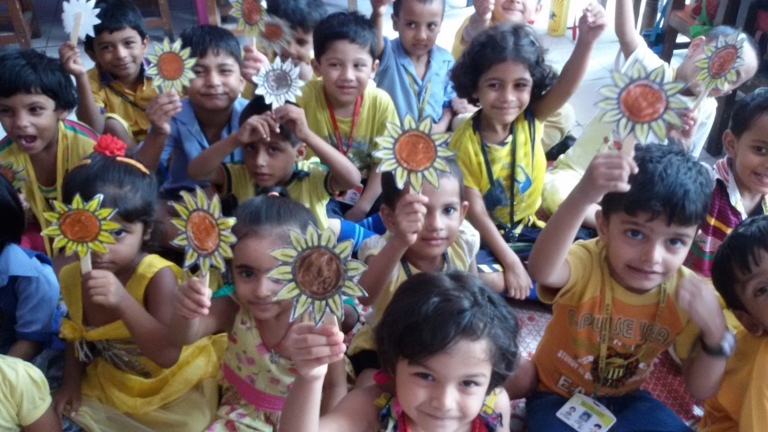 Children propitiated the elements of nature to bless them with good weather, health, peace and prosperity. 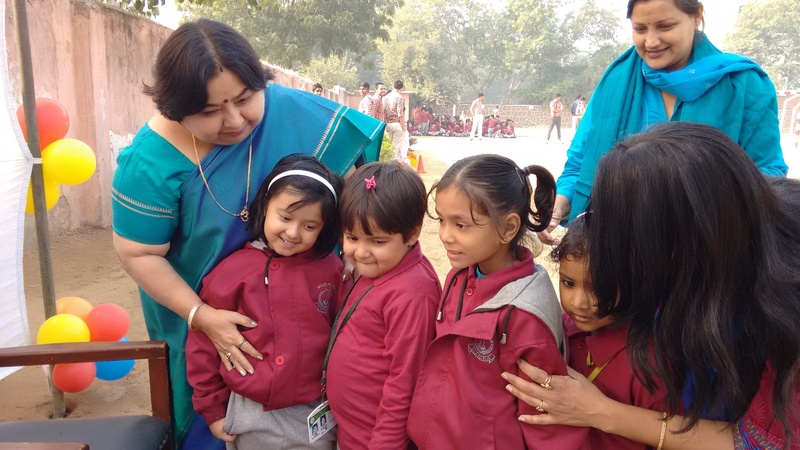 Children chanted the havan mantras and performed the havan with their teachers.The school ensured that each child inculcates the values and traditions ethics and etiquettes that are a part and parcel of our Indian culture. The school aspires to make its students better citizens of tomorrow. 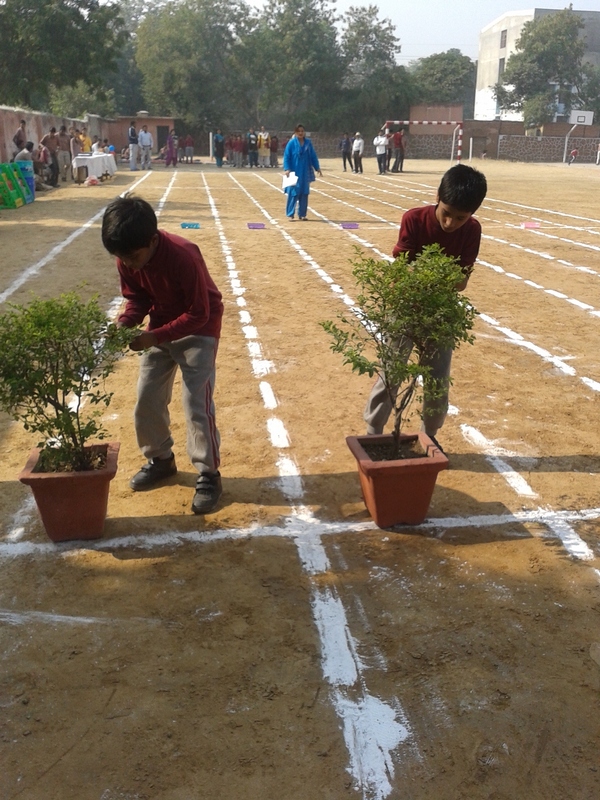 School celebrated Earth Day with fervour and zest. The Day was celebrated in an Assembly which began song sung by students of class IV. 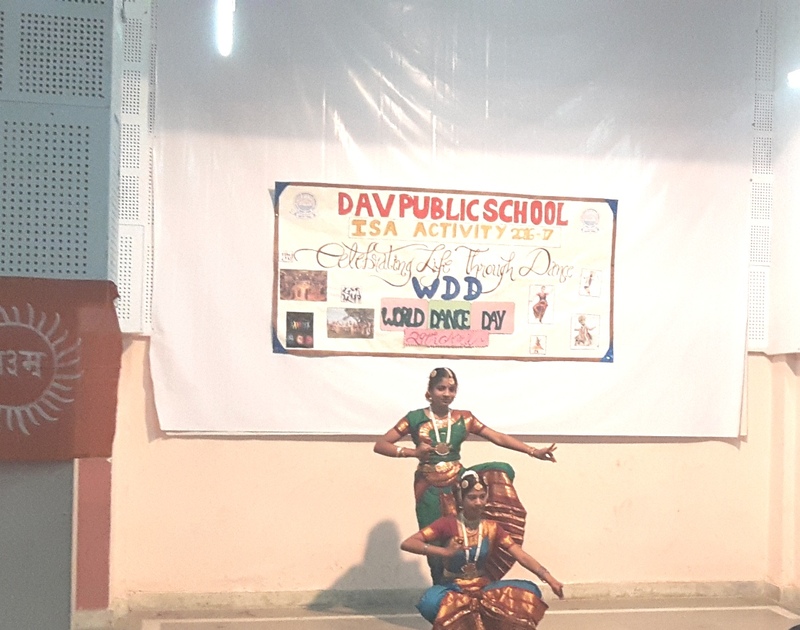 Class II students presented a beautiful dance on ‘Save Earth'. 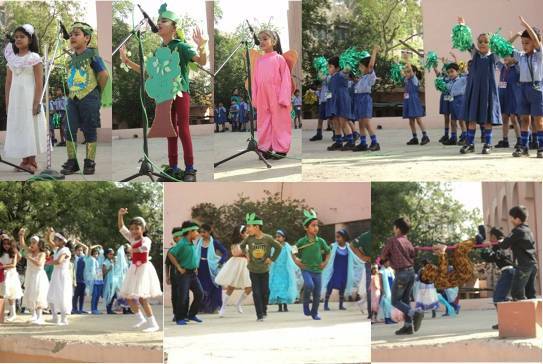 Students of Pre Primary dressed up on the theme of Earth Day and transformed the entire stage into beautiful Earth. Class III students given their speech presentation. 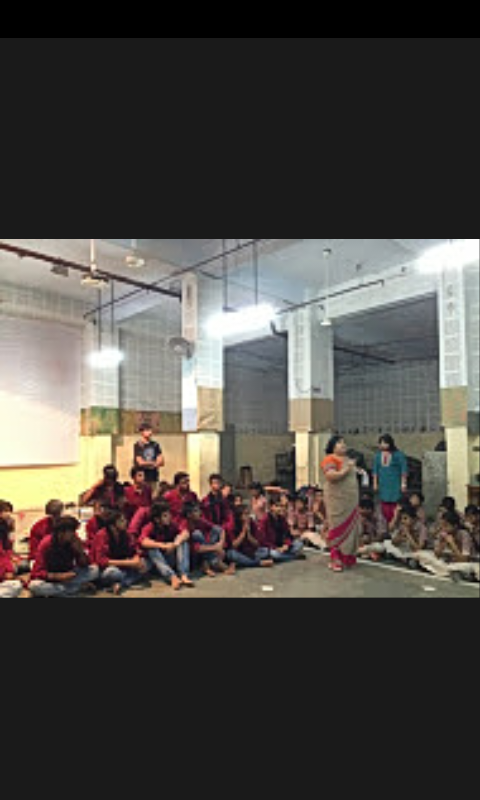 The Earth Day's importance was explained to the students by school Principal Mrs. Anju Puri. 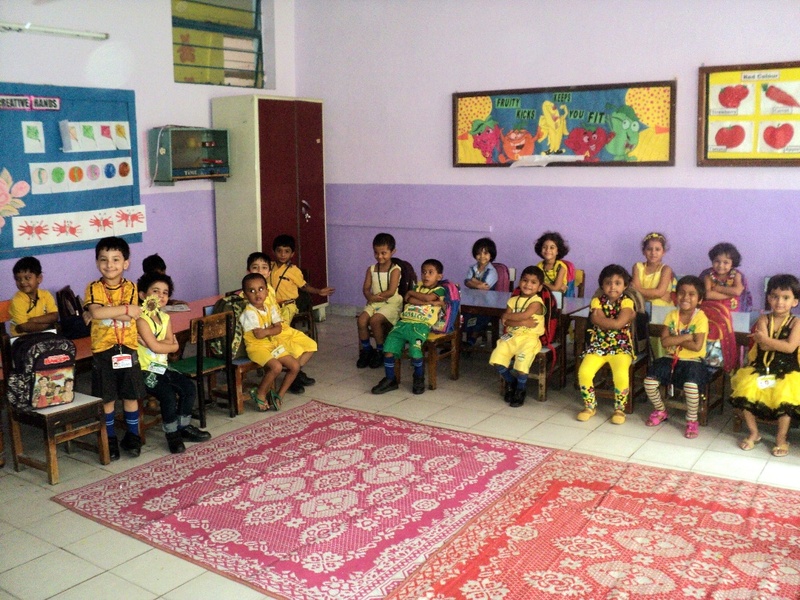 Students took part in various classroom activities like Handprinting, drawing, painting etc. 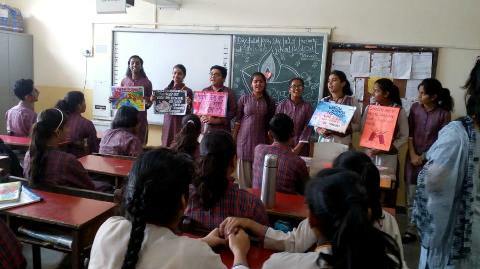 Earth day is an annual observance held on April 22 every year to increase public awareness on the environment.Poster-making Competition was organized in the school for classes V-VIII on April 21, 2015. 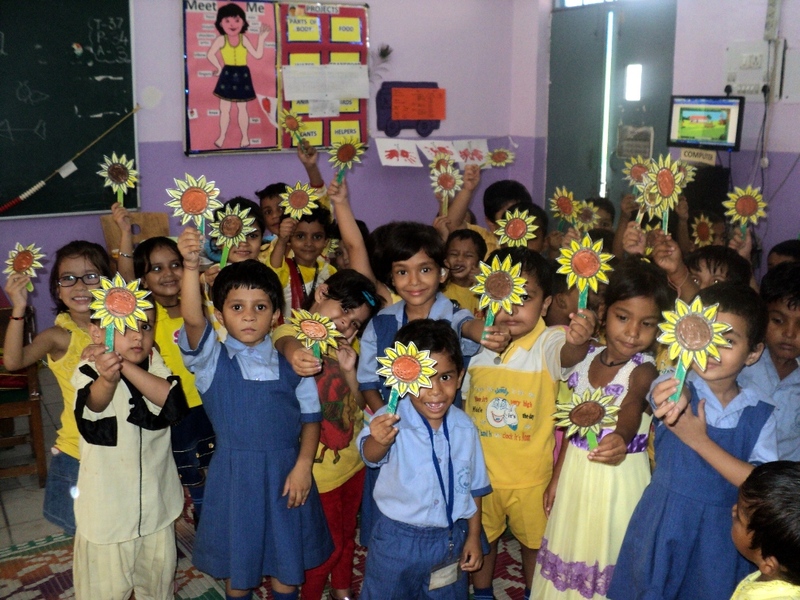 The students took great interest and were excited to express their feeling for environment and Mother Earth through their creativity. 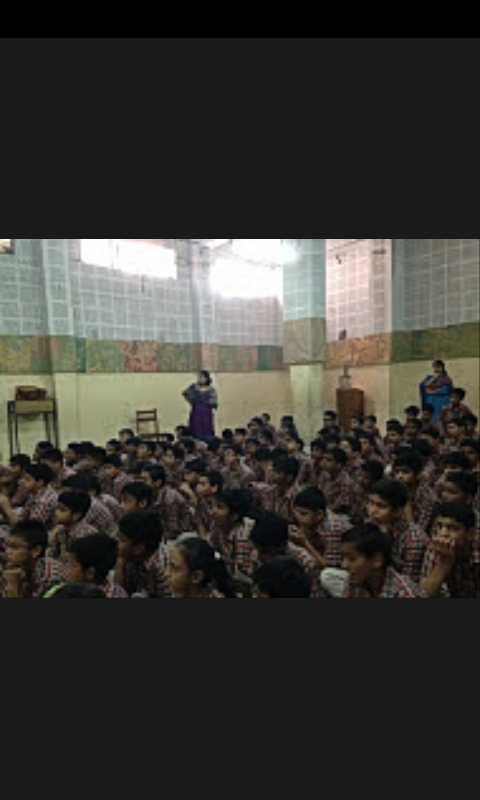 EARTH DAY QUIZ - The quiz was held among the students of Class VII and VIII on the theme ‘EARTH DAY’ in the school basement on 25th May, 2015.Four students from each section represented their respective section.All the participants were very active and enthusiastic throughout the quiz and became more confident with the help of applauses provided as support by the audience. Health Week was observed from 7th April 2015 to 10th April 2015. 7th April marks the founding of WHO.The activities were organized in the school to highlight the significance of the issue of good health and well-being such as slogan writing, rally, preparation of healthy breakfast and drinks and debate for classes V-VIII.It was a unique experience to come together for a week to promote actions that can improve our health. 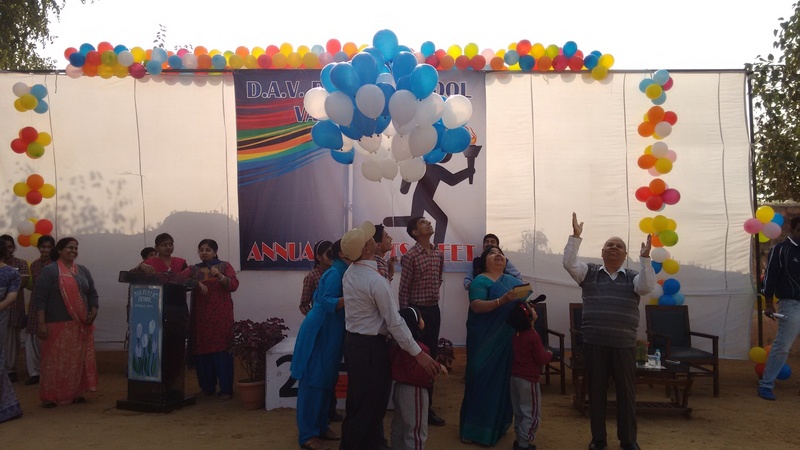 The students celebrated it with great aplomb by enhancing awareness about it. Class V Theme - "Eat Well Stay Well"
Class VIII Debate on " Healthy Food Vs Junk Food"
School celebrated World Health Day on April 7. 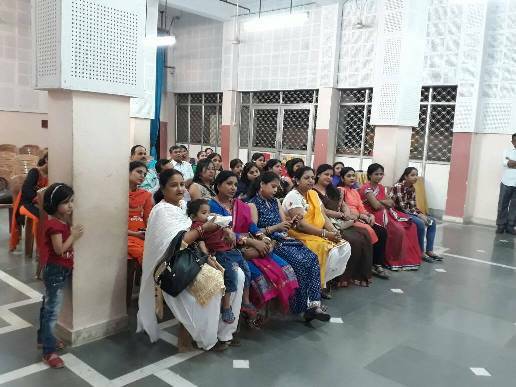 Various activities like Fruit And Vegetable Colouring, Vegetable Printing, Eat Healthy Be Healthy-Discussion through Colouring Sheet, Collage-Healthy Food , Placards On Health Quotations, Salad Making-Sharing Healthy Recipes With Nutritional Value and Slogan Writing etc. were conducted. Students were given message of total fitness through health, hygiene and nutrition. 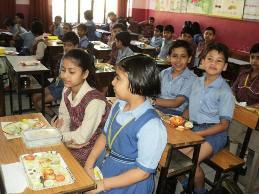 Importance of balanced diet and ill effects of junk food were discussed with students. 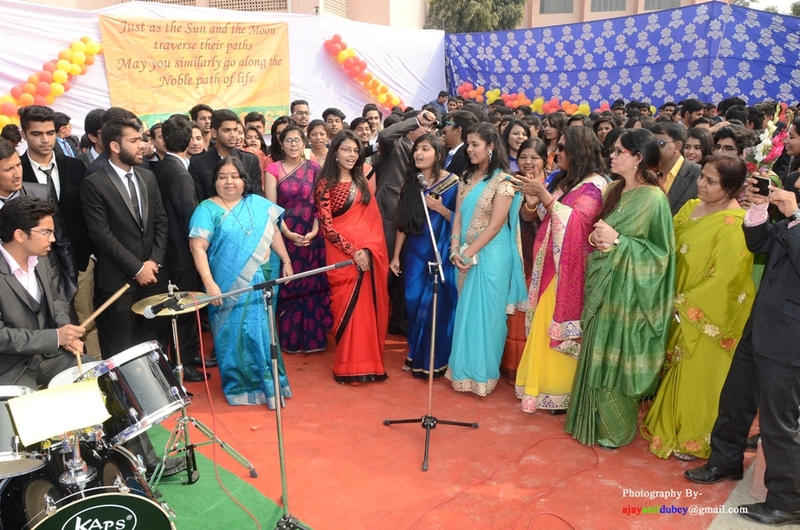 School celebrated Baisakhi on April 13, 2015. 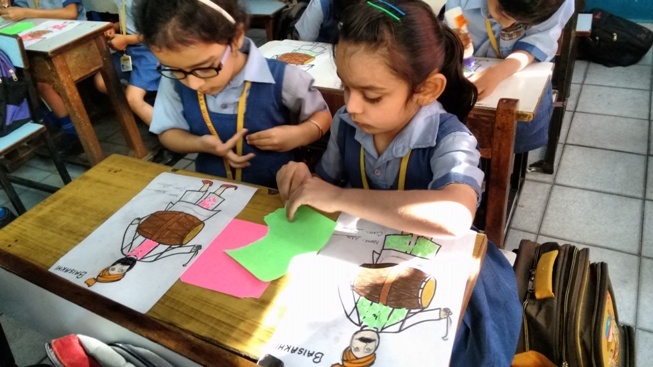 Various activities like Colouring Worksheet in Class-Preschool and PrePrimary, Tearing & Pasting - Baisakhi Scene in Class-I, Drawing & Colouring - Baisakhi Scene in Class-II, Creative Writing Activity On The Theme in Class III and Drum Making (Paper Glass) in Class IV etc. were done with fun and festive mood of kids. 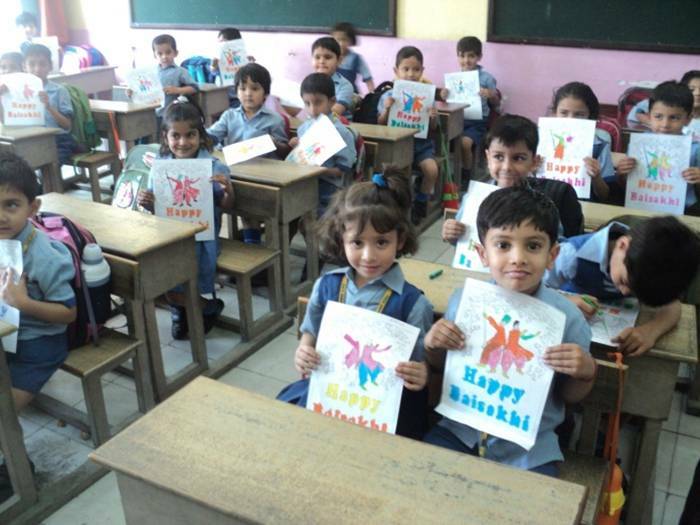 Baisakhi festival was celebrated on 13th April 2015 by Classes V-VIII with enthusiasm. The purpose was to make the students aware about the historical background, significance and relevance of Baisakhi. 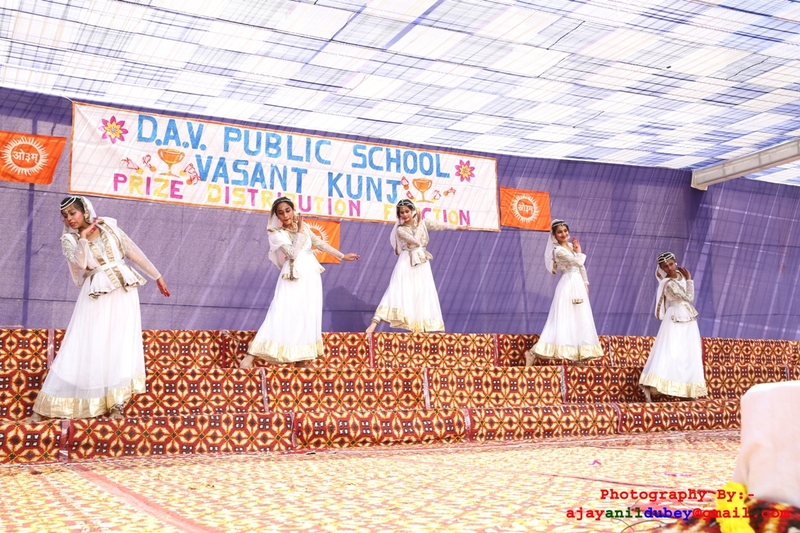 Students from class V performed a skit aimed at the historical background of the festival.Bhangra performance was given by the students of class V with great energy and excitement.Punjabi folk dance competition was organized on 16th April 2015 for the students of class VII. Splashes of colour, foot-tapping rhythms and swirling body movements conjured up images of culturally-rich Punjab as enthusiastic students presented folk-based group dance items. 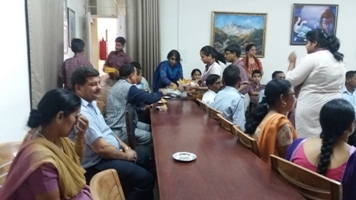 As part of Baisakhi celebration food fiesta was organised on 16th April 2015 in the school.Students of class VI participated in the event.Traditional food from Punjab was made available during the event.Zestful students relish the best of Punjabi cuisine on the joyful festival of Baisakhi. Special ‘Hawan’ was organised in the school premises for the celebration of ‘Hindu Nav Varsh’. The New Year day was observed on 21st March 2015 and is regarded as auspicious to start any new venture. It is also a great moment to witness the colorful traditions and customs of the various Hindu sects of India. An inspirational speech on ‘Veda’ was given by Mr. Shastri to aware teachers about the importance of ‘Om’ and ‘Shloka’. 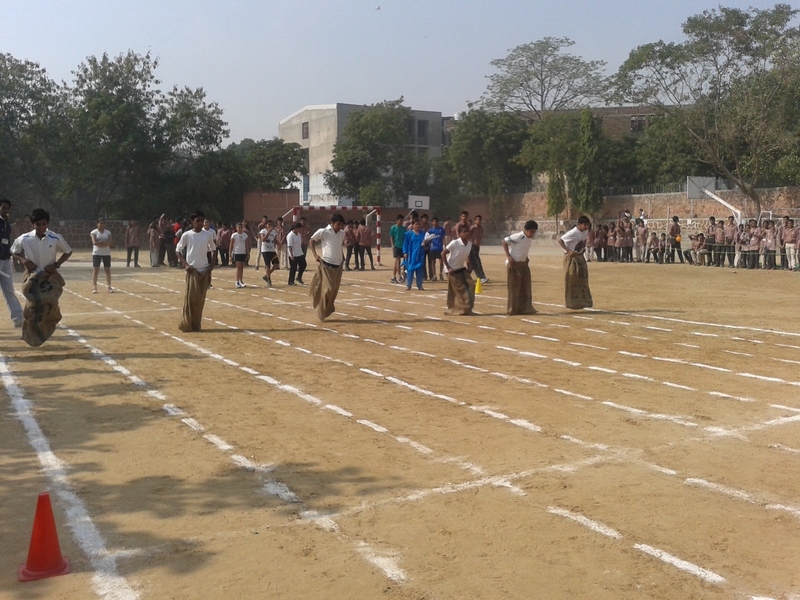 The school organised The Annual Sports Meet as part of Children’s Day Celebrations. The objective of the meet was to promote games and sports for health and physical fitness. 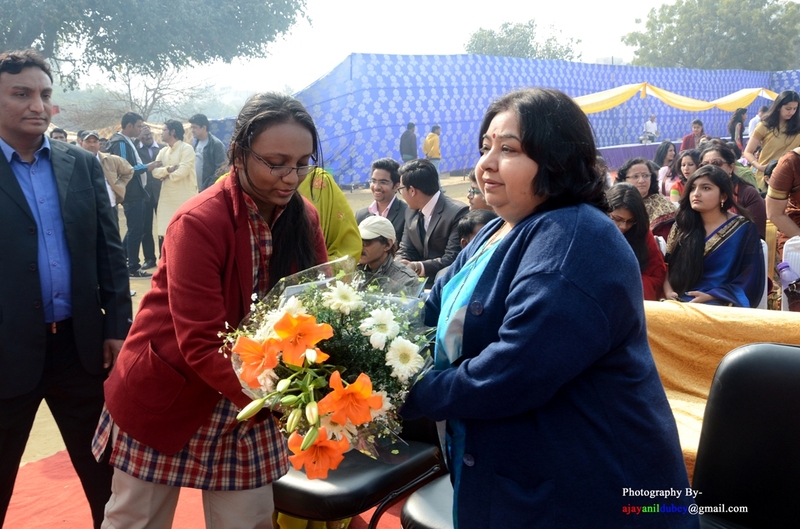 The school Principal welcomed the School Manager, Sh. H.L. Bhatia on the occasion. 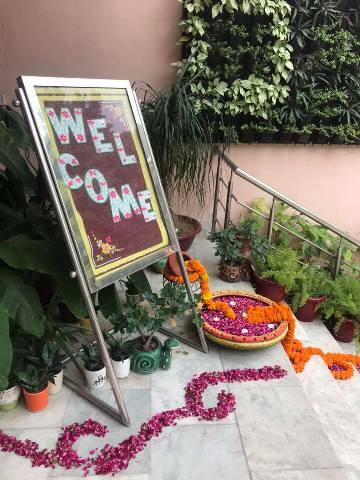 The students welcomed the School manager and thanked the Principal for making everyday in the school a special day and making all activities child centric making it a perfect Children’s day gift for them throughout the year. The School Manager addressing the students on the importance of engaging in sports and games for a healthy mind and body. Sh. H.L. 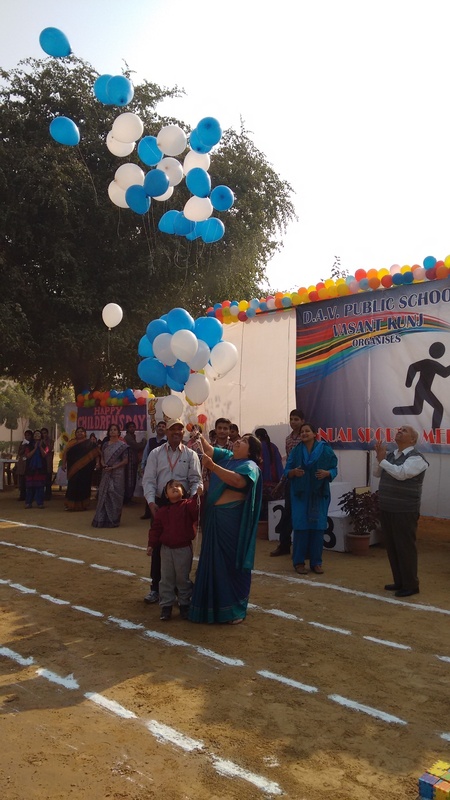 Bhatia and Mrs. Anju Puri, the school Principal released colourful balloons and declared the Meet open. 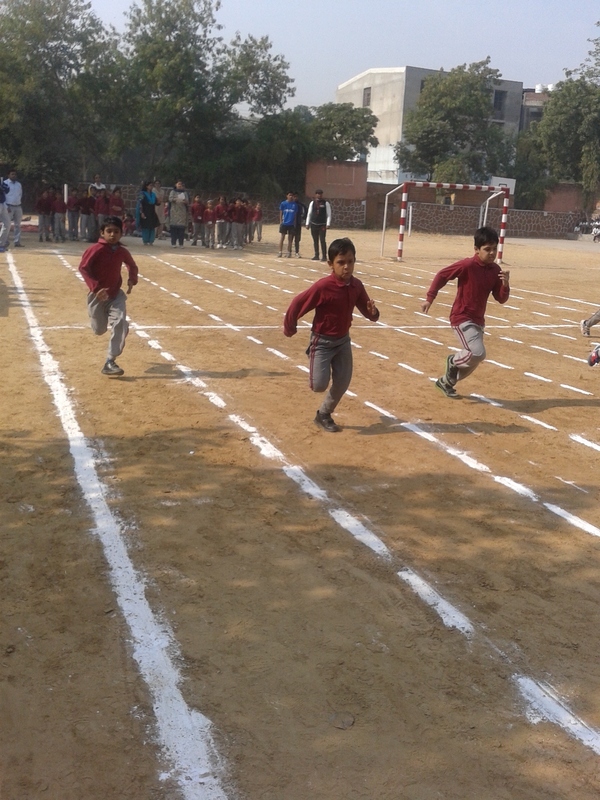 The sports activities began with hurdle races, obstacles and fun games for the tiny tots of Pre-School and Pre-Primary. 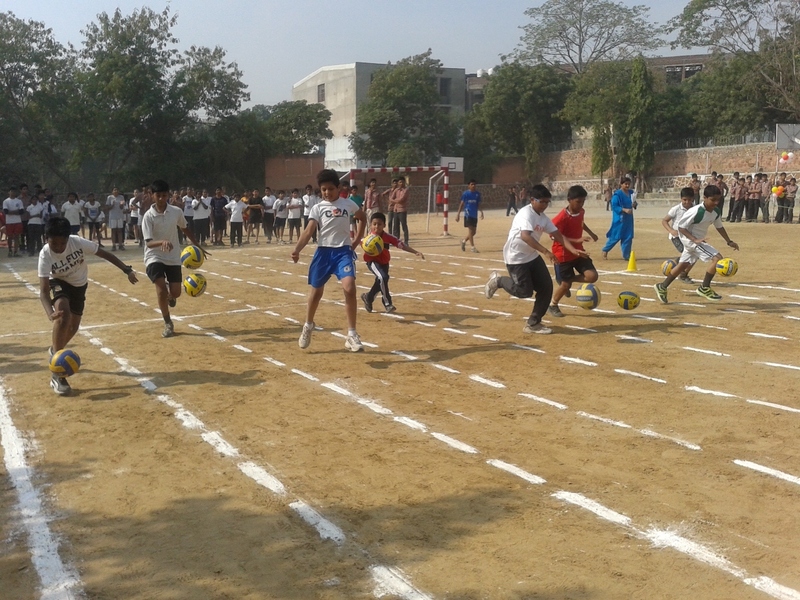 The students were energetic and participated in true game spirit. 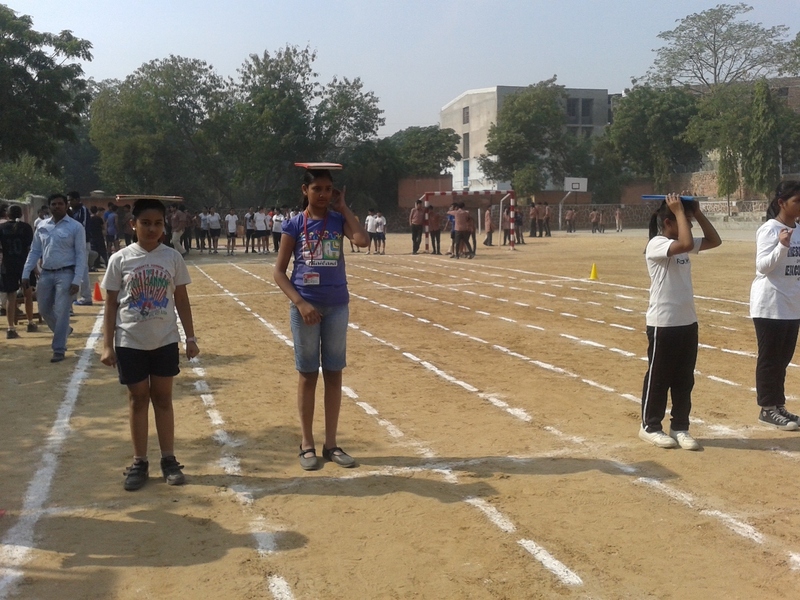 The Primary classes and the middle school students displayed their team spirit in various sporting events such as sack race, lemon and spoon, frog leap, relay races and numerous athletic events. The happiness, exuberance, energy and healthy competition was the highlight of the day. The children composed couplets, jingles and slogans encouraging the players. The football match between the players of classes 11th and 12th tested their stamina and strength capturing the interest of the whole school building an atmosphere of frenzy and excitement. The children expressed their gratitude towards their teachers for organizing the event making Childern’s day a memorable occasion for them. 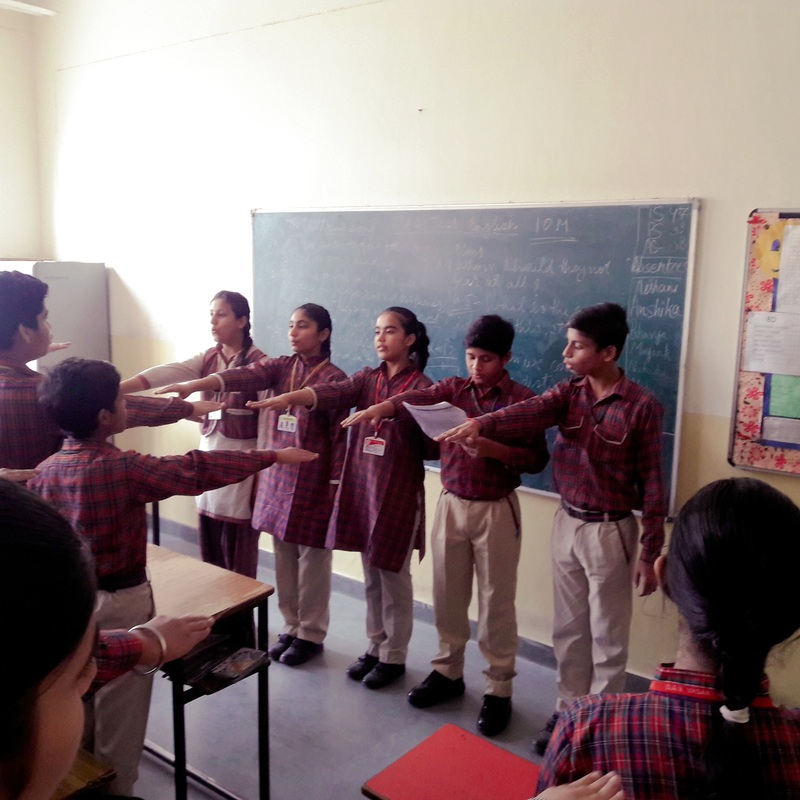 PROJECT SHOW - CLASS- I "LIVE AND LET LIVE"
DAV Vasant Kunj Spreading the message of LIVE AND LET LIVE. The students of Class- I displayed their creative potential through a project show titled ‘My Friends-Animals’ on our planet. 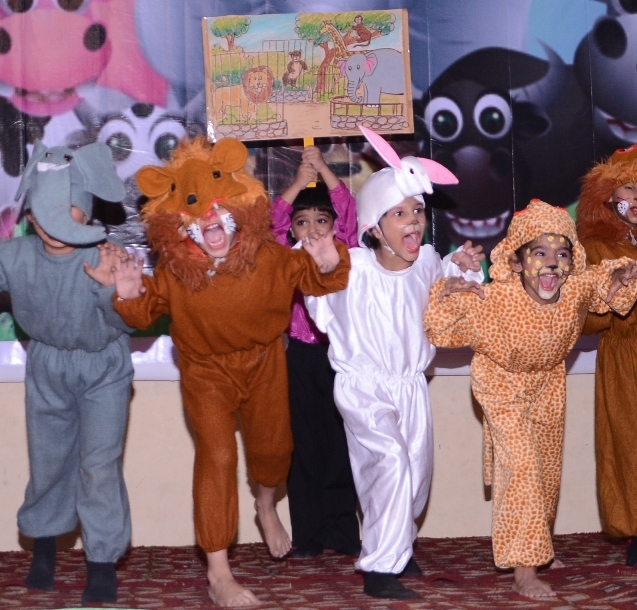 The students highlighted the message of kindness towards animals and portrayed the maxim of ‘Live and Let live’ through dramatization of farm animals and wild animals. 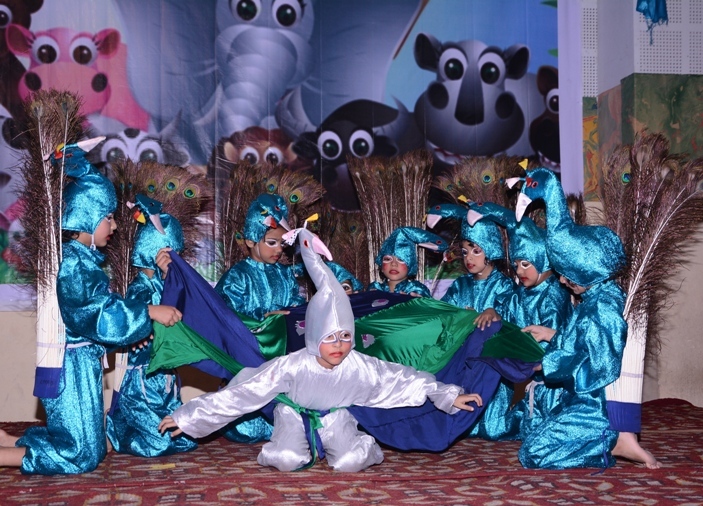 The children expressed, through lively songs and dances, the cruelty meted out to animals and the insensitive attitude of the people towards animals. Their dialogues were effective in highlighting the exploitation of these innocent animals by man for his pleasure or profit. Their mesmerizing dances and thought provoking dialogues won them the appreciation of the audience. The well knit show prompted the audience to applaud the students whole heartedly while pondering over serious concerns such as hunting and poaching of animals for their products. The School Principal, Anju Puri appreciated the show congratulating the children for their sensitivity and raising their voice for these mute creatures. The school Manager, Sh H. L. Bhatia expressed his elation at the holistic development being provided to the students of the school. The school , in association with the Red Cross Society, organised a blood donation camp in the school premises. The school was determined to make the drive organised by Arya Pradeshik Pratinidhi Sabhi and DAVCMC a success to mark the 150th Birth Anniversary of Mahatma Hansraj. The Principal addressed the students, held active meetings with teachers, alumni and student body encouraging them to inspire their friends and relatives to join the drive. An invitation was sent to the parents enumerating the benefits of donating blood and requesting them to be a part of the blood donation camp. The students requested their parents with the teachers joining in motivating the parents to donate blood. The students went on a door to door campaign to be a part of this process. They also composed slogans, designed creative posters and organized an awareness Rally to motivate people to join the blood donation camp. 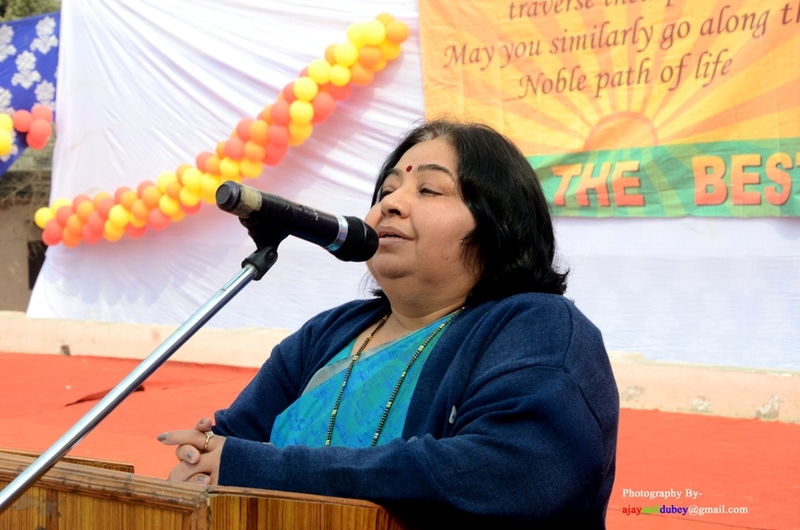 The event began with the school Principal, Mrs. Anju Puri and all the participants chanting Gayatri Mantra to invoke the blessings of the Almighty. 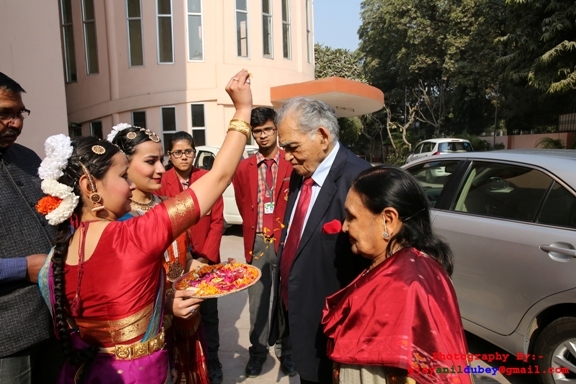 Mr. J.K. Kapoor Secretary, DAV College Managing Committee and Sh. H.L. 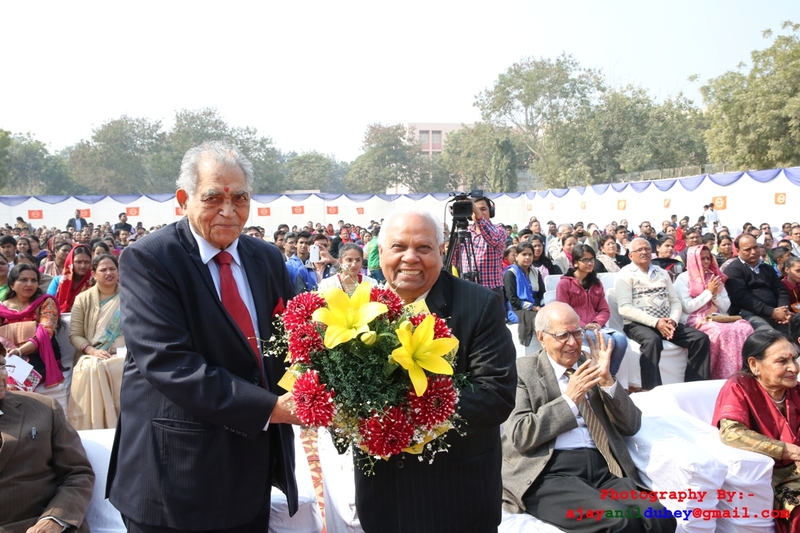 Bhatia, Secretary, DAV College Managing Committee and School Manager, D.A.V. 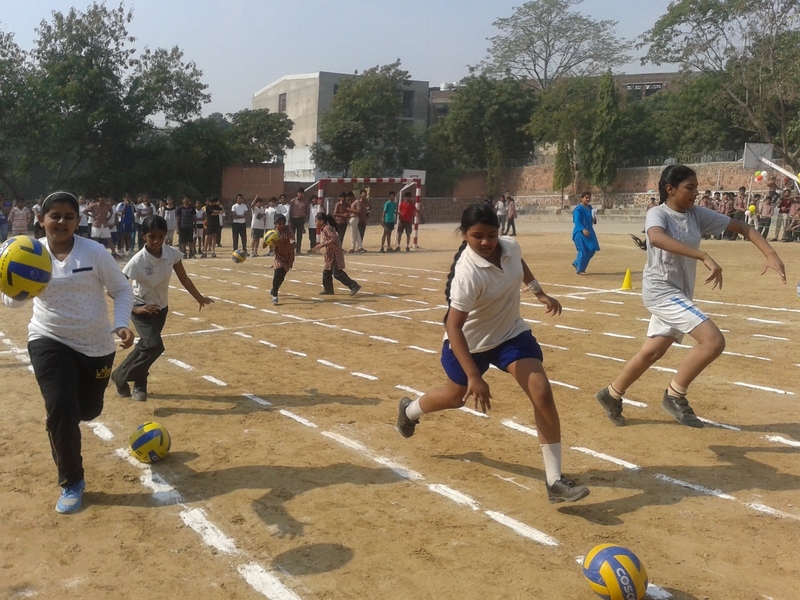 Public School, Vasant Kunj were also present on the occasion to inspire the participants. The parents and all the staff members displayed true humanitarian spirit, a hallmark of every DAV member by participating in the camp enthusiastically. Even the residents of localities in the vicinity joined the camp making our total tally of participants to 198. The donors found fit were happy to contribute in saving someone’s life and 95 units of blood was collected. The pride of the students for their teachers and parents was reflected on their faces while distributing certificates, gifts and refreshments to the donors. They thanked each donor profusely with the Principal joining in with a letter of gratitude saluting their spirit and for being an exemplary figure for their children. The Red Cross Society co-ordinator, Ms. Poonam appreciated the efforts of the school congratulating them for successfully motivating people and creating awareness about the benefits of donating blood. The Principal proposed a vote of thanks to the DAV College Managing for this noble initiative and expressed gratitude towards all the participants for making the camp a success. 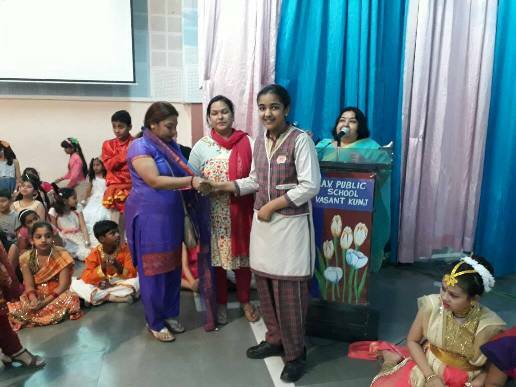 A Prize Distribution was held to honour the winners of various Inter-School Competitions. A Special Assembly was conducted to mark the birthday of Guru Nanak Devji. 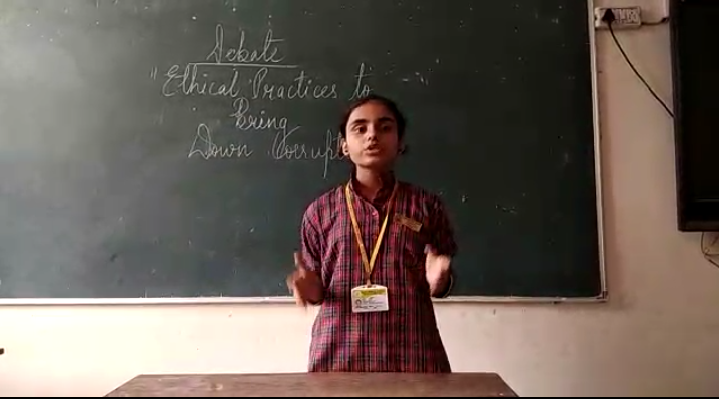 The Vigilance Awareness Week is being observed this year from October 27, 2014 to November 01, 2014 2014 to spread awareness about uprooting corruption from the society. . Class VI students composed creative Slogans on empasisizing the needs of a transparent system in dealings so as to promote honesty and Integrity. Class VIII debated over the topic "E-ticketing has been effective in reducing corruption from Booking System". D.A.V. Vasant Kunj celebrated Rashtriya Ekta Diwas in remembrance of Sardar Vallabh Bhai Patelji by taking a pledge followed by Principal Ma'am address. 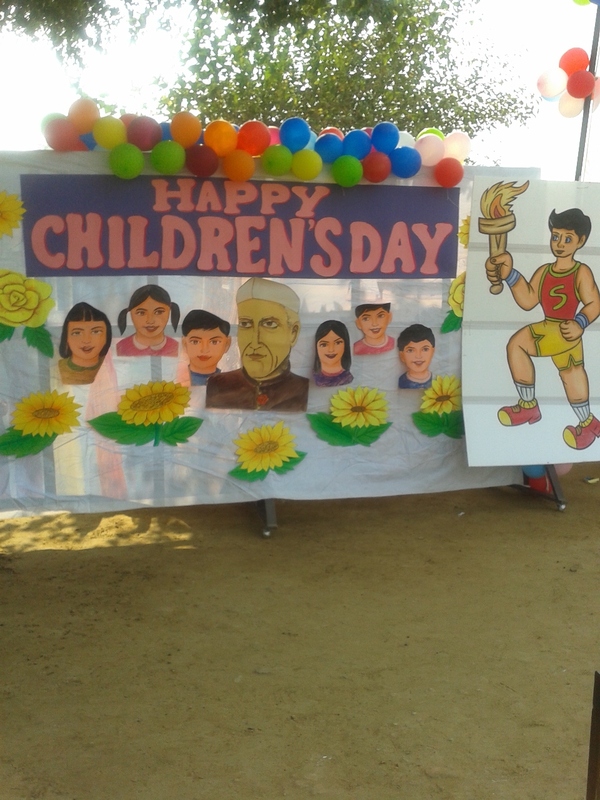 Various activities were performed in the school at different levels such as Poster Making, Jingle Composition, Collage Making and Run for Unity by the kids. 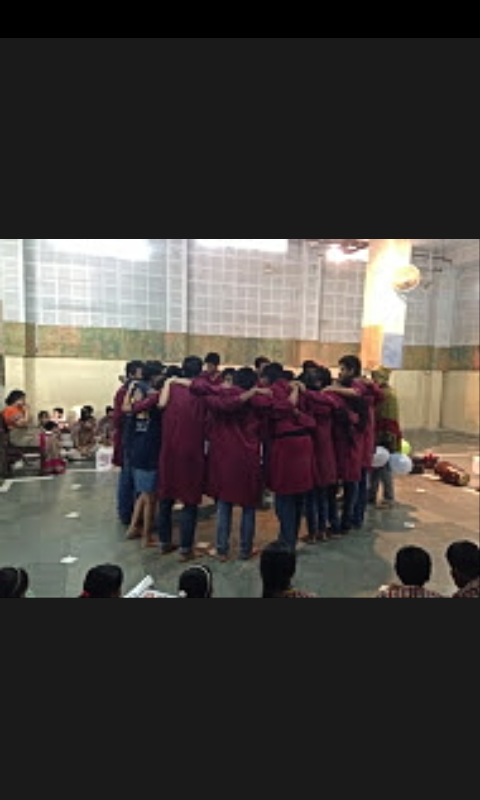 At Dav Vasant Kunj, Elder’s day (1st October) was marked by a heart touching street play performed on 30th September by ‘Vayam’ - the theatre society from Shivaji college. It brought out the selfish, sad and cold behavior of the youngsters towards the elders in our society today. It depicted the journey of the life of elders which is often filled with selfless dedication not only towards their children but also grand children. However not worried about the returns from this emotional investment they often find themselves unwanted by those very family members and are sent to the ‘home for elderly’, later in life. This leaves them starving for love, care and respect which none of the family members feel for them. 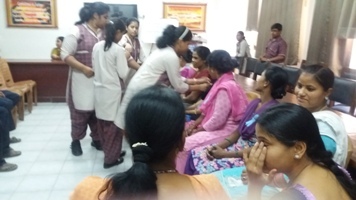 It sensitized the students about the vital contribution of our elderly to us and how we need to show them in our own little ways that we ‘care for them’. This performance was a part of the ‘Chetna Shivir’ conducted at DAV Vasant kunj for bringing about awareness on such issues. It encouraged children to imbibe such socio cultural values which are an integral part of their personalities and which go a long way in making them better human beings. A Special Assembly was held to mark the five day long celebration of DIWALI - 'The Festival of Lights'. RAMAYAN was enacted by the students. An anti cracker rally was taken out by the students of Class VIII in Vasant Kunj area to enlighten the citizens on SAFE DIWALI. 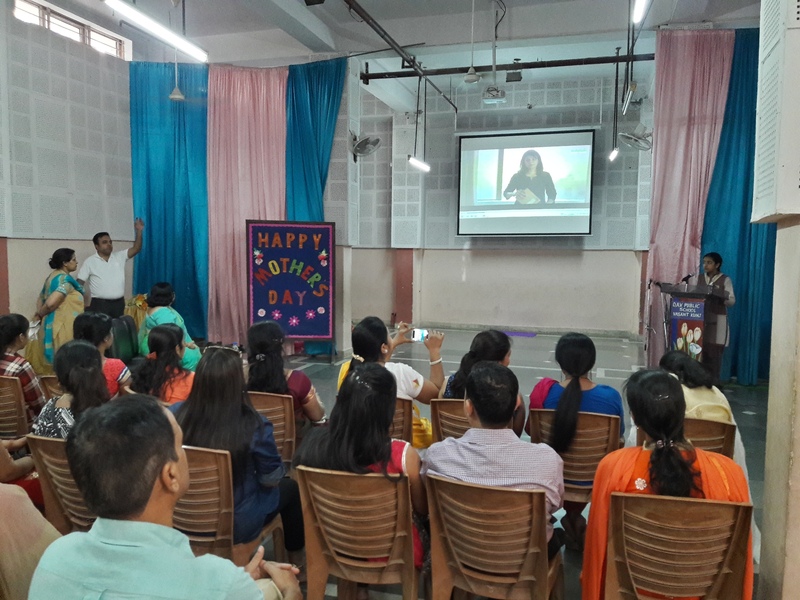 A Special Assembly was conducted to celebrate the birthday of 'Father of Nation' on 2 October 2014 as well as the festival of Dusshera to mark the victory of GOOD OVER EVIL.Speeches, Dances, Poems were performed by the students. A pledge was taken by the Students, Teachers along with Principal Ma'am to support the CLEANLINESS DRIVE initiated by our Prime Minister Shri Narendra Modi. School Principal Mrs Anju Puri encouraged the students to keep their surroundings clean be it at home or school.Effigy of Ravana was burnt to make students aware of Lord Rama's victory over Evil. 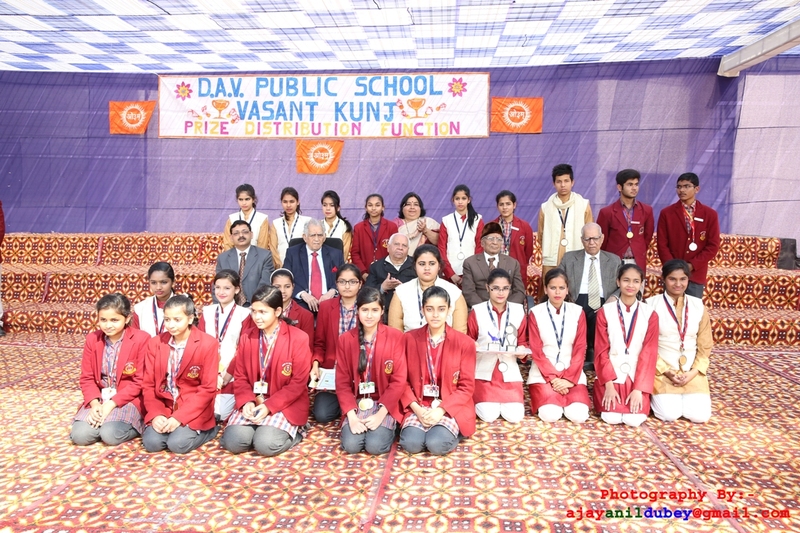 The dedication and commitment of the teachers and students of DAV Public School, Vasant Kunj was acknowledged and appreciated in a glittering award ceremony ‘ Guru Vandan-Chatra Abhinandan’ organized by Bharat Vikas Parishad. The organization zealously promotes cultural, social, moral, national and spiritual upliftment of the youth of the country by honouring exemplary achievements of the teacher and the taught in the field of education. 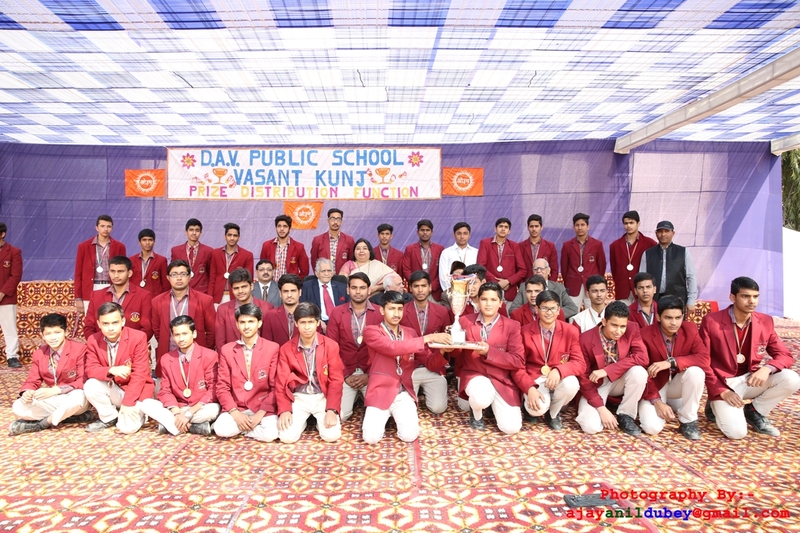 The teachers and students of DAV Public School, Vasant Kunj were felicitated in a glittering award ceremony ‘Guru Vandan- Chatra Abhinandan’ organized by Bharat Vikas Parishad, a voluntary organization serving to promote cultural, social, academic, moral, national and spiritual upliftment of the youth of the country. Ijiya Samajhna, and Tanya Mittal of class XII were awarded for their academic accomplishments, oratorical skills and creative writing abilities. Debajyoti Nayak of class XII was felicitated for his creativity, imagination and achievement in a plethora of competitions while Karan Kaushik was awarded for his leadership and display of extraordinary talent through participations in various platforms in varied events. The organization honoured the Manager of the school, Sh H.L. Bhatia for being a true leader and inspiring the teachers and students with his active involvement and constant guidance in establishing the school as a hallmark of excellence. 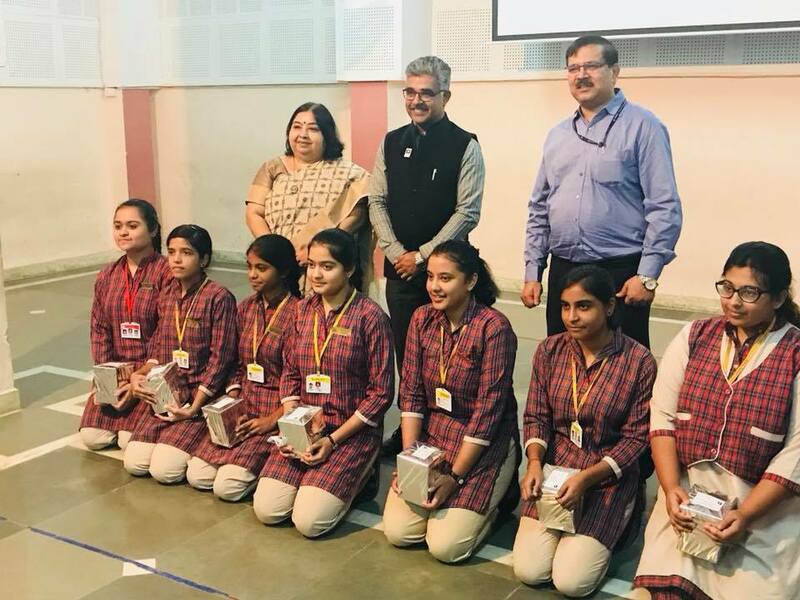 Mr. Dalbir Singh, PGT Mathematics, Ms. Manju Arora, PGT English, Ms. Poonam Sharma, TGT and Ms. Nalini Dhawan, PRT were awarded for their committed , dedicated and selfless service to the school . These teachers were honoured for making a place for themselves in the hearts of students in a time when respect for teachers is an almost lost value. The Manager, Sh H.L. 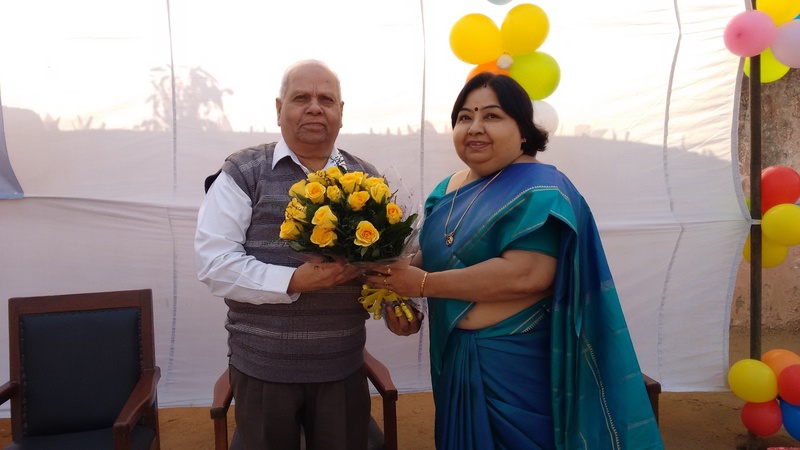 Bhatia and the school principal congratulated the teachers and students on the occasion for their whole hearted commitment to the cause of education and their passion to dispel the darkness of ignorance with the light of knowledge. It was an auspicious moment for D.A.V. Public School, Vasant Kunj when they gave their students an opportunity to engage in unbridled capacity to shower their love and respect to their teachers on the occasion of Teacher’s day. A programme was organized wherein the students recited shlokas, presented a melodious song showcasing the beautiful relation between students and teachers. The students also emulated some famous leaders who were also responsible teachers. 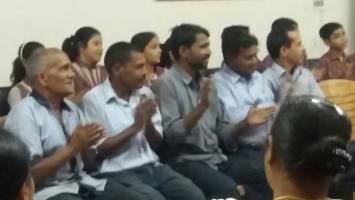 The efforts were highly appreciated reacting with resounding claps of joy. Principal, Ms. Anju Puri extended her best wishes along with conveying the real motive behind celebration such occasion. She emphasized the importance of the teachers in student life. He said the best gift the student can give his teacher is to outshine him. She also stressed upon the role of teachers in shaping the personality and character of a student, who, is a part of a bigger society. The celebrations concluded with reciting of Shanti path. Hindi Pakhwada was observed at D.A.V Public School, Vasant Kunj. 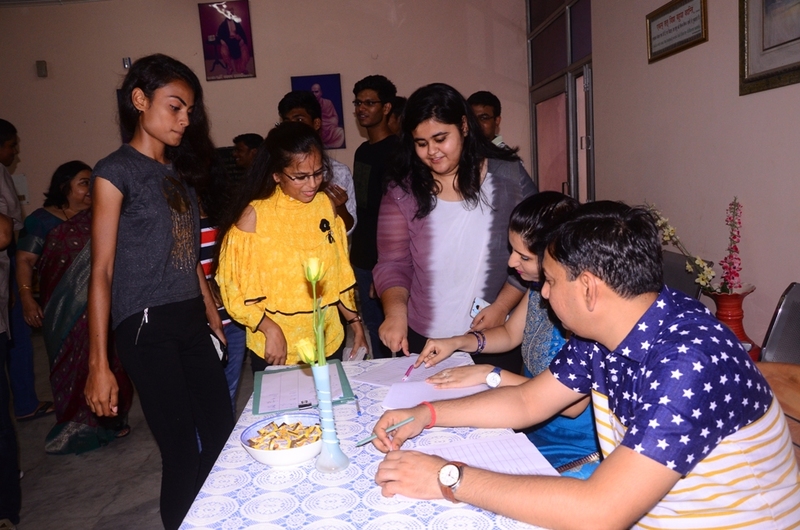 During the event, several different competitions were organized in Hindi such as shlok recitation, doha recitation, imitation of eminent personalities and self-composed poems . 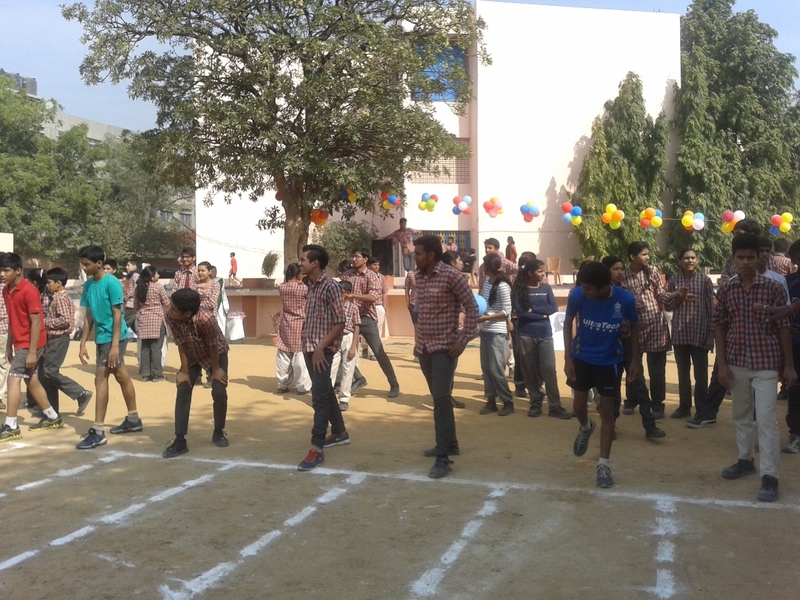 Active participation from the middle wing was observed for all the competitions. This celebration stressed on the need of paying more attention on the use of Hindi in day to day work . Display boards were also adorned showcasing the work and pride of Indian writers. All the classes displayed their talent creative and aesthetic skills. 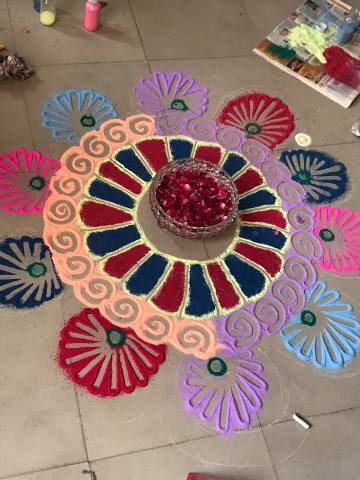 The students evoked their creativity and prepared the board with vibrant hues and glitters. 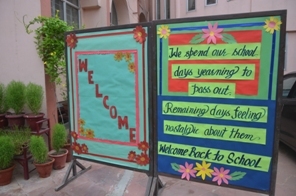 The innovative ideas of the students could be seen in the form of excellent and colourful displays. This not only brought out the creativity of the students but they also learnt to work as a team to achieve a common goal to enhance the importance of our national language. D.A.V. 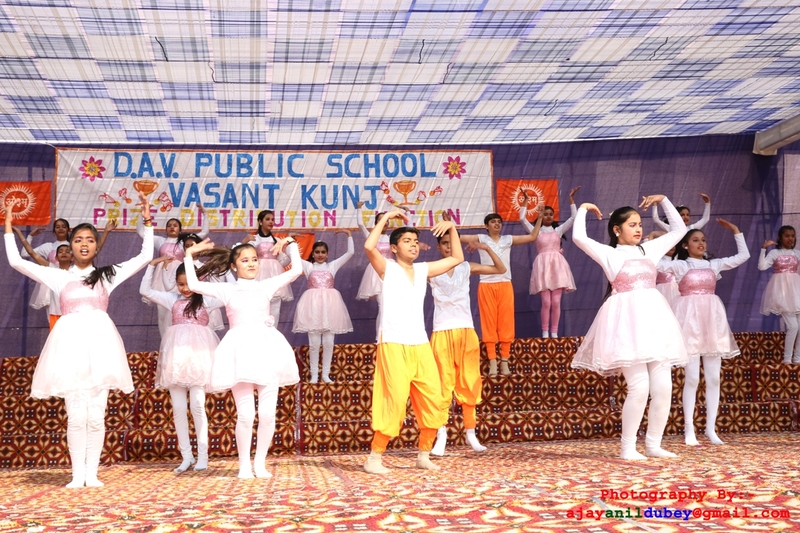 Public School Vasant Kunj celebrated the festival of Janmashtami with fervour and zest. 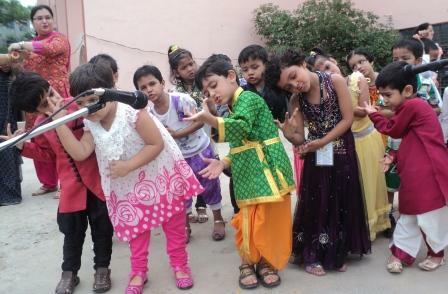 Krishnashtami was celebrated with gaiety which began with a speech by Ayush of class IV. 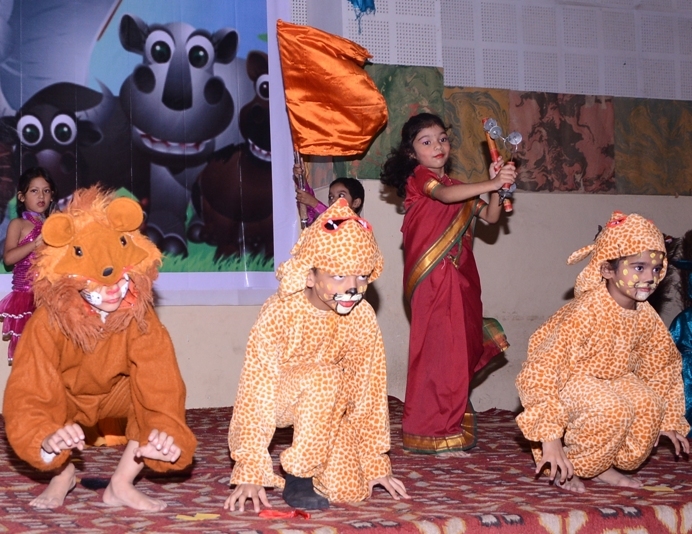 The tiny tots (Pre School students) presented a beautiful dance on ‘ Makhan Chor ‘. Students of Pre Primary dressed up as Krishnas and beautiful gopies transformed the entire stage into Vrindavan. Dressed up in colourful attire the students danced with great enthusiasm and mesmerized the audience. 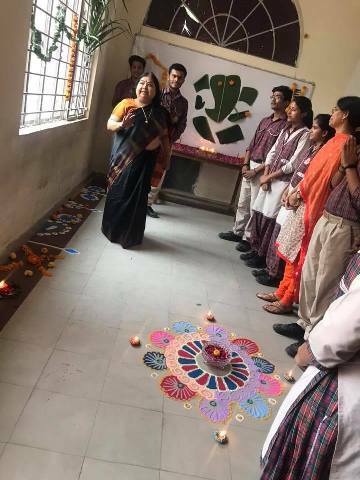 The festival’s importance was explained to the students (when, why and how we celebrate Janmashtami) by school Principal Mrs. Anju Puri. 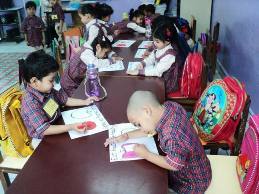 Students took part in activities like drawing, painting, crown making and flute decoration. 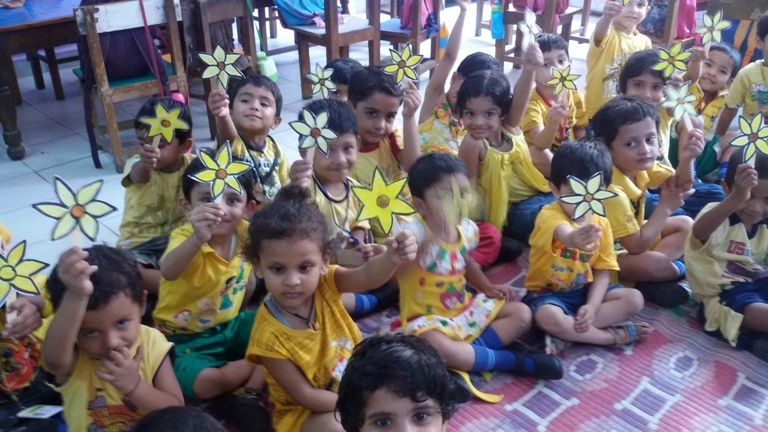 Students of Pre School and Pre Primary made Krishna Mukut. Class I children beautifully decorated Krishna flute. Children were thrilled to dance on Krishna songs and bajans. Fun and frolic marked the day. A Special Assembly was organized by the students of Primary and Middle Section to celebrate Raksha Bandhan as “Suraksha Diwas”. 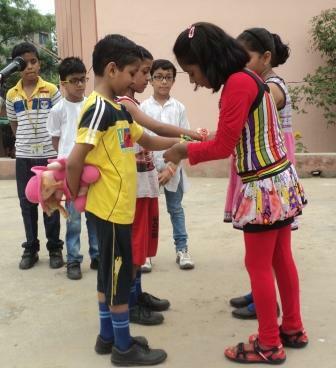 Students tied rakhis on the wrists of all the Support Staff of the School to show their love and respect towards them and also to thank them for all the support rendered by them. 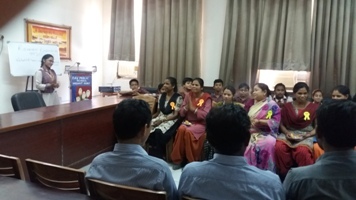 School celebrated World Health Day on April 7, 2014. Various activities like vegetable printing, salad making, making of placards (Slogan writing) etc. were conducted. In the special assembly students were given knowledge about how to do meditation. Students meditate with the enchanting of ‘Om’. Students were given message of total fitness through health, hygiene and nutrition. Teachers talked about how to stay fit and healthy. Importance of balance diet and ill effects of junk food were discussed with students. 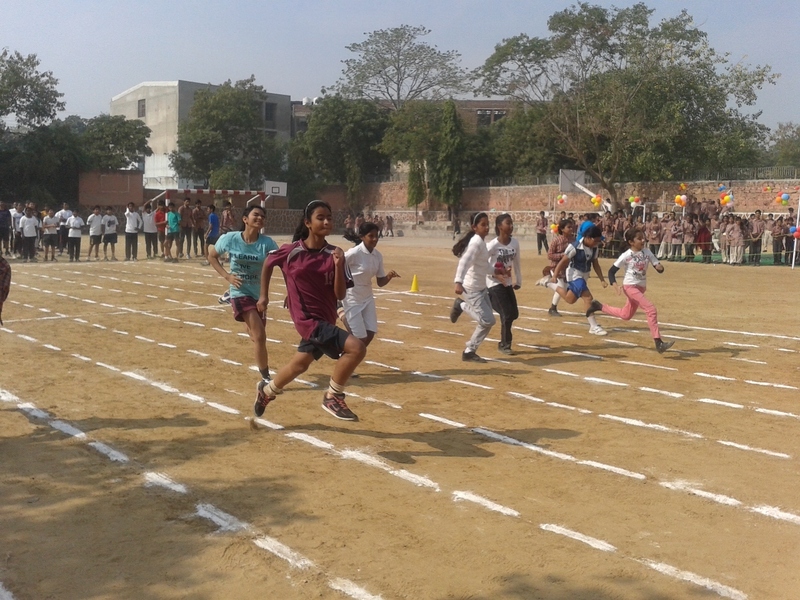 Students were encouraged to put their best to attain fitness as ‘Good Health is the key to happy life’. 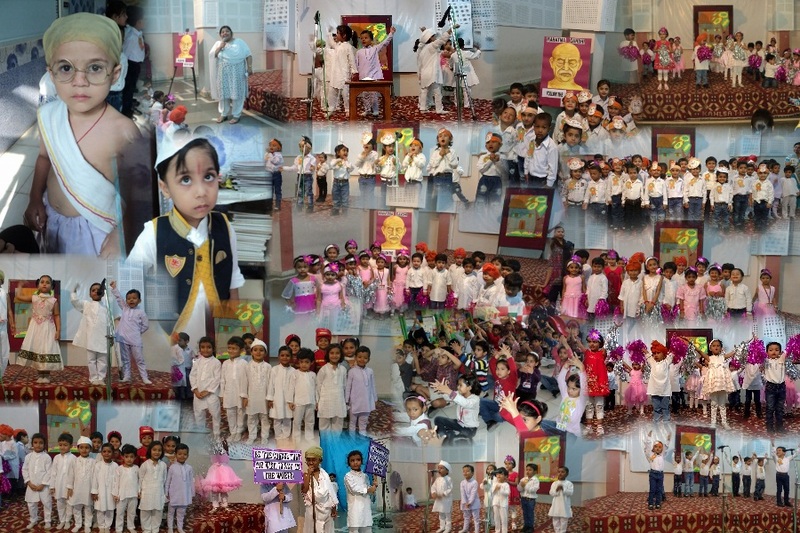 School celebrated Baisakhi on April 11. 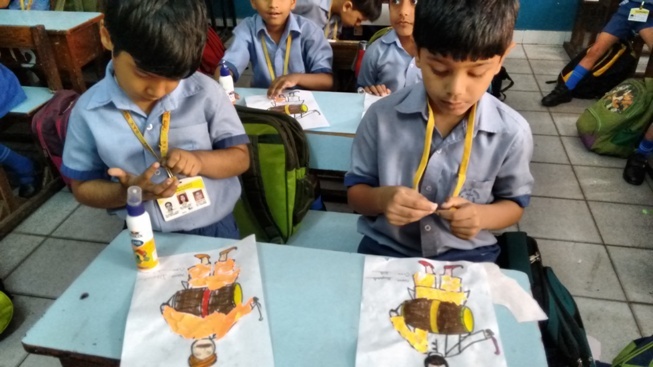 Various activities like Colouring worksheet, Drawing & Colouring, Tearing & Pasting - Baisakhi Scene, Speech after discussion in class, and drum making etc. were conducted. 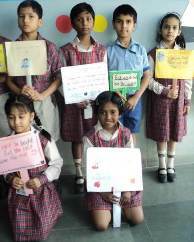 School celebrated 'Earth Day' . Special assembly was conducted on this occasion to spread awareness among students to save environment. An inspiring speech was delivered by Aayush of class IV which forced the audience to think upon their role in preserving the 'Mother Earth' . A skit was performed by class I students on the theme depicting the contrast between town and city life regarding pollution problems and how can we bring a change to improve and eradicate the ill effect of pollution through tree plantation. A group song by the students of class III on the theme 'Beauty of Nature' was also in the series of items. 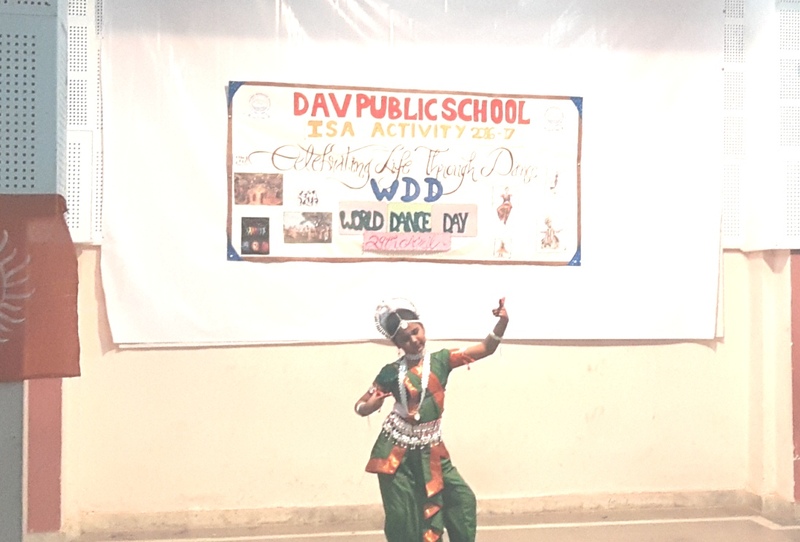 The program proceeded with a splendid dance performance by the students of class ll which created awareness regarding the steps to be taken to preserve our environment. 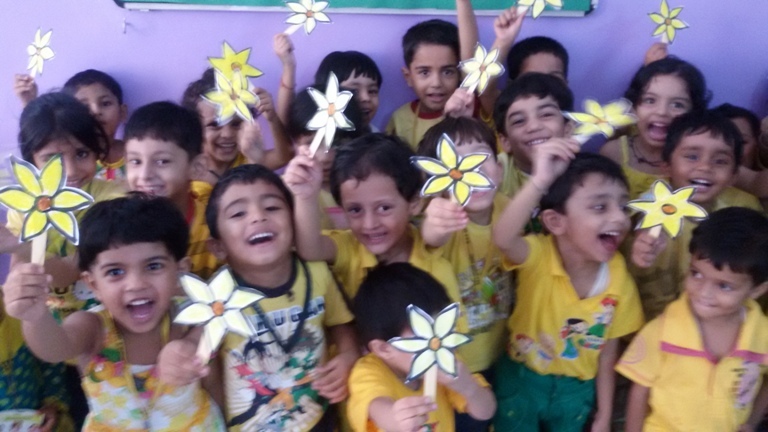 Students of pre primary did leaf printing with slogan 'Do not cut me - Plant more trees' and were told about the importance of trees and cleanliness.